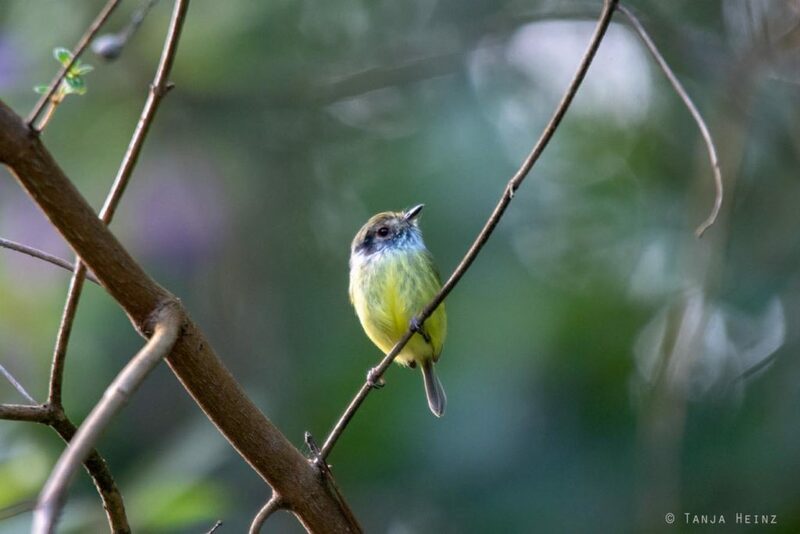 If you are interested in birds, then you probably know that Brazil is one of the best places for bird watching. 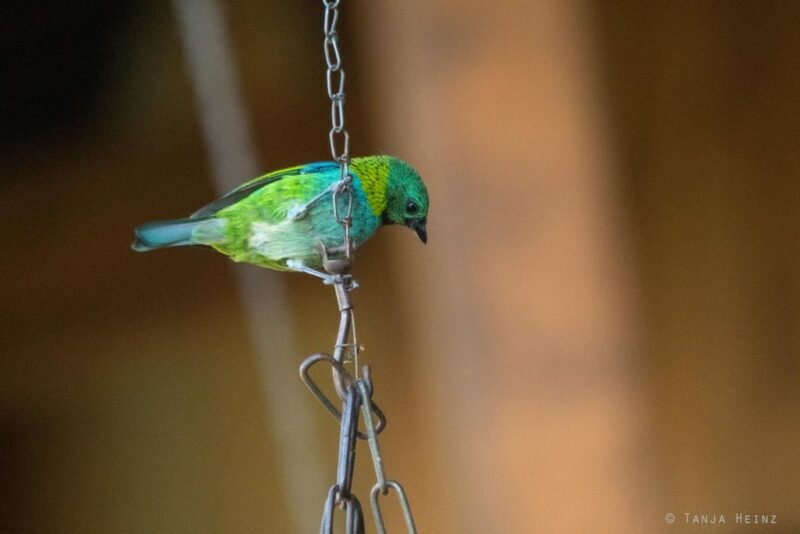 With more than 1800 bird species, Brazil is one of the most biodiverse countries with respect to birds. 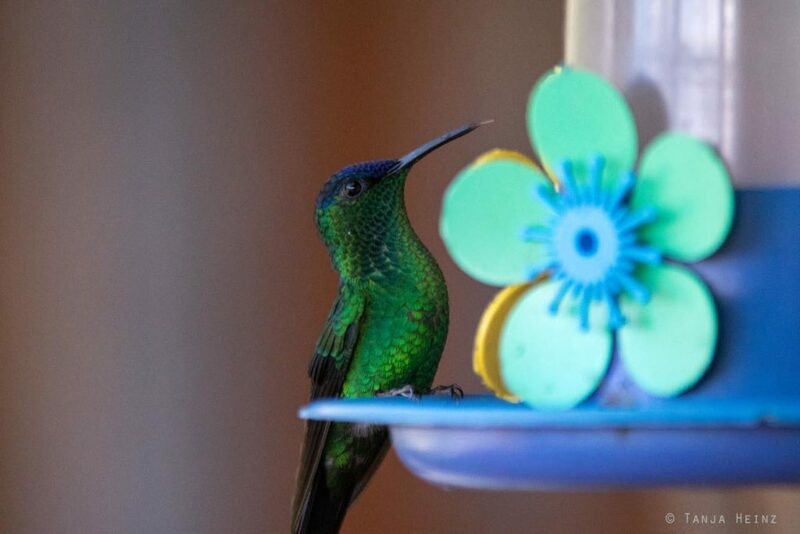 About 60% of all bird species in South America occur in Brazil. 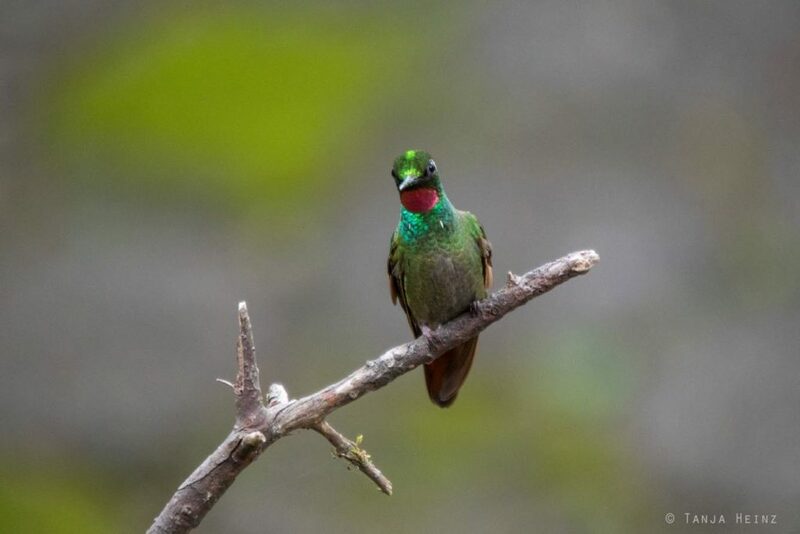 Among them are, for example, hummingbirds or toucans, but also tyrants and tanagers. All of them are typical birds for America. Of course, for me it was obligatory to learn and see more about birds in Brazil during my journey through the South of this country. At the end we decided to visit the Itatiaia National Park in the state Rio de Janeiro. 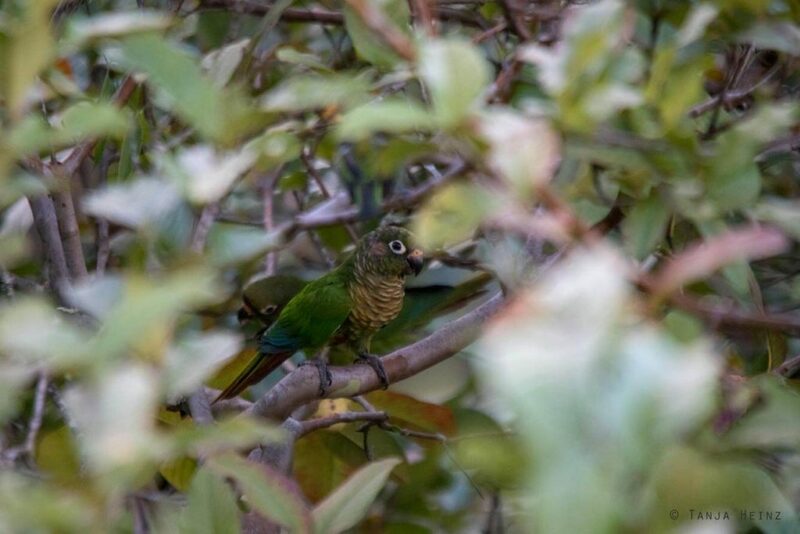 On one hand we were already close to the Itatiaia National Park as we visited the city Rio de Janeiro, and on the other hand, I had heard before that this place was extremely rich in bird diversity. I took notice of the Itatiaia National Park for the first time on Instagram. 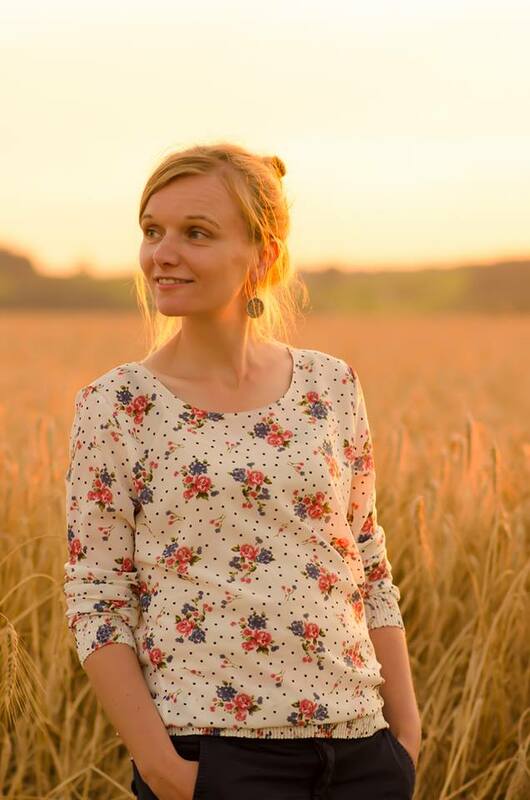 On this social platform I became aware of very beautiful photos from a user (@birdsrio_birdwatching). 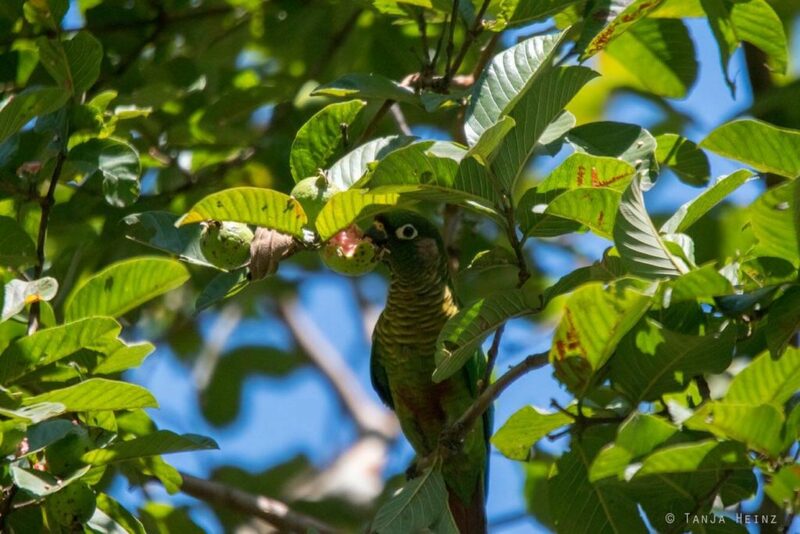 As the Brazilian wildlife, and especially the Brazilian birdlife, was absolutely new for me, I decided to book a tour at BirdsRio Birdwatching. 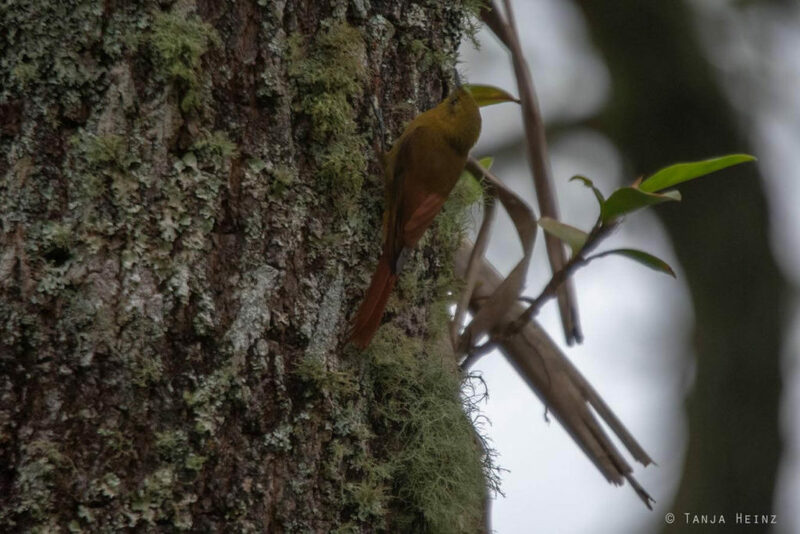 However, before I tell you more about the tour and all the birds I had seen, I give you some more information about the Itatiaia National Park. The Itatiaia National Park was established in 1937. It is the oldest national park in Brazil. The national park is located in the Mantiqueira Mountain and extends across the states Rio de Janeiro and Minas Gerais. There are four towns in Rio de Janeiro and Minas Gerais located at the border of the Itatiaia National Park. And that is Itatiaia and Resende in Rio de Janeiro and Itamonte and Bocaina de Minas in Minas Gerais. You need about 200 kilometers from the city Rio de Janeiro and about 250 kilometers from São Paulo to reach the Itatiaia National Park. The Itatiaia National Park can be divided into two regions. On one side there is the Upper Part and on the other side the Lower Part. The Lower Part is characterized by dense Atlantic Forest with abundant flora and fauna. The vegetation in the Upper Part, in contrast, differs considerably when compared to the Lower Part, because in the Upper Part grasslands are predominant. Therefore, the Upper Part is more characterized by open landscapes. The highest peak of the Itatiaia National Park is the Pico das Agulhas Negras with 2.791 meters. 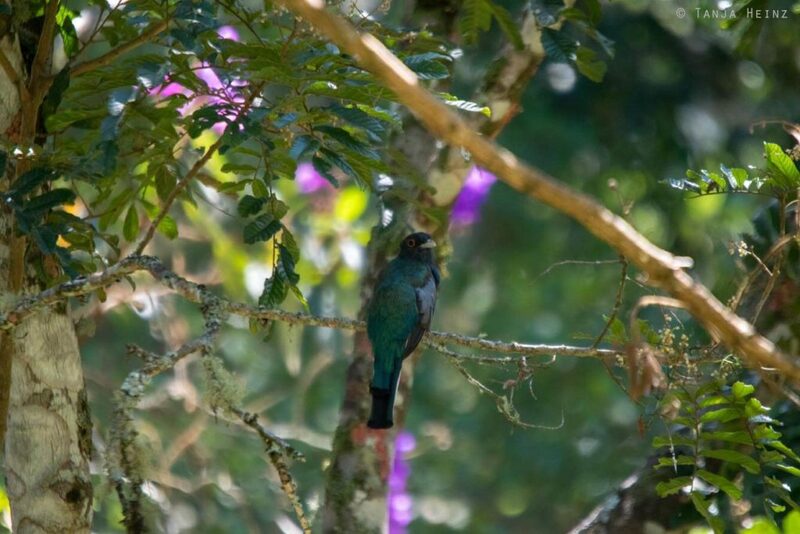 You can also expect to meet different wildlife in the Itatiaia National Park depending on where you are. Either on the Upper or in the Lower Part. 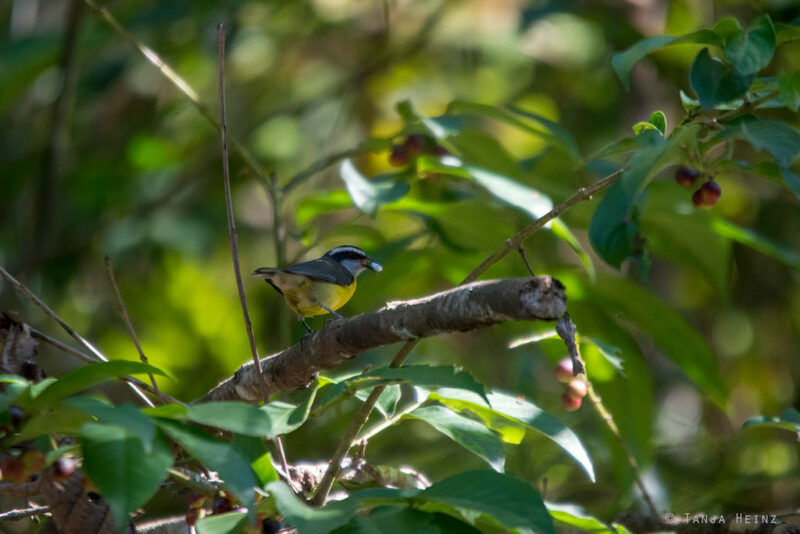 The Itatiaia National Park is especially interesing for bird watchers as more than 380 bird species are known to live in the national park. 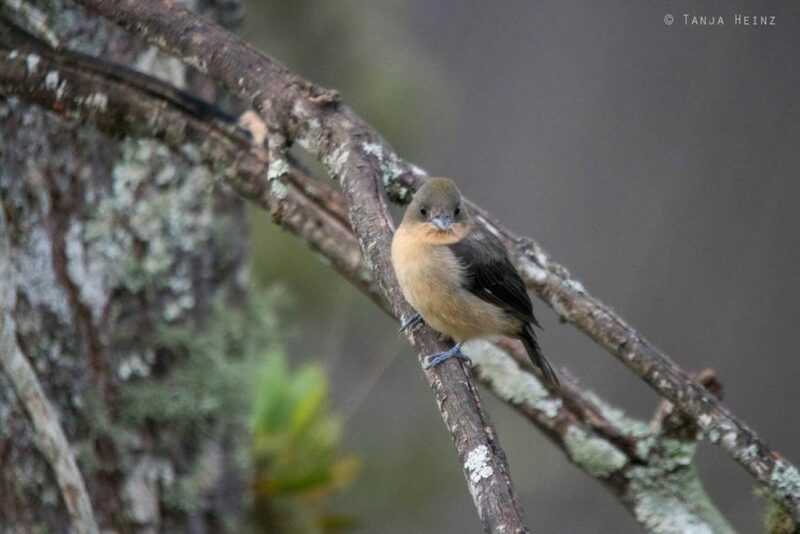 About 50 of them are endemic, and thus, occur only in the region around the Itatiaia National Park. 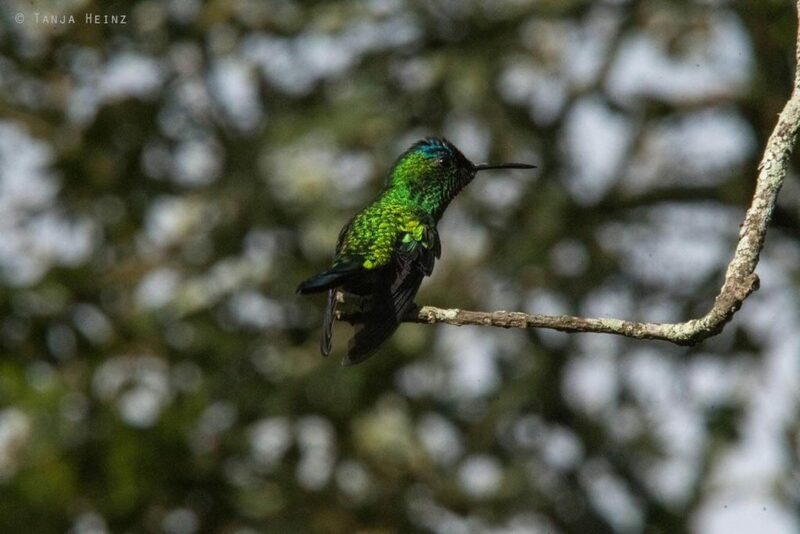 In addition to it, about 5.000 different insect species, 50 mammal species and numerous reptiles and amphibians can be found in the Itatiaia National Park. In total we stayed two full days in the Itatiaia National Park. That is definitely too short in order to get to know the fauna of the Itatiaia National Park. As we stayed just two days in the Itatiaia National Park, we got to know only the Lower Part. 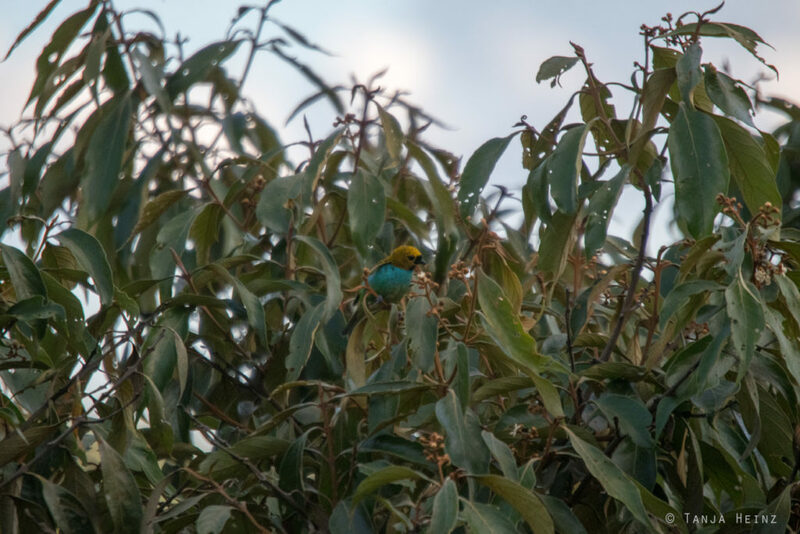 On our first day wie participated in an excursion with BirdsRio Birdwatching and on our second day we explored the Itatiaia National Park on our own. 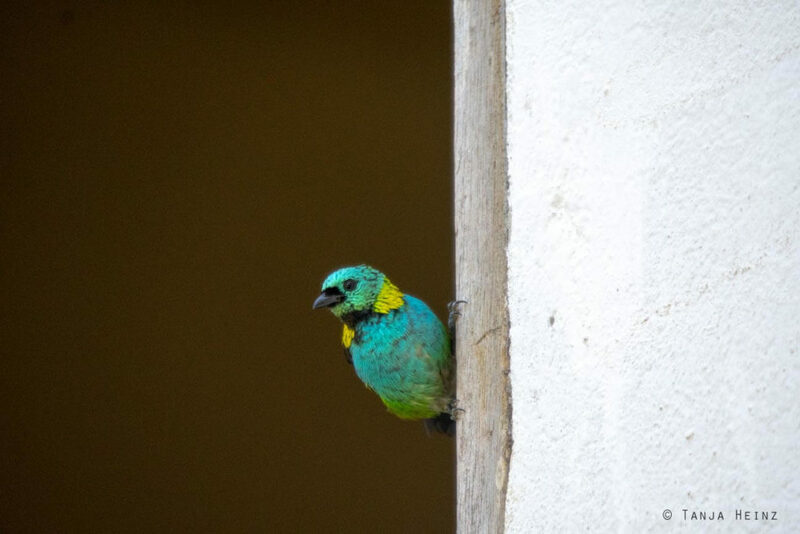 BirdsRio Birdwatching was founded by the bird expert and bird photographer Hudson Martins Soares. 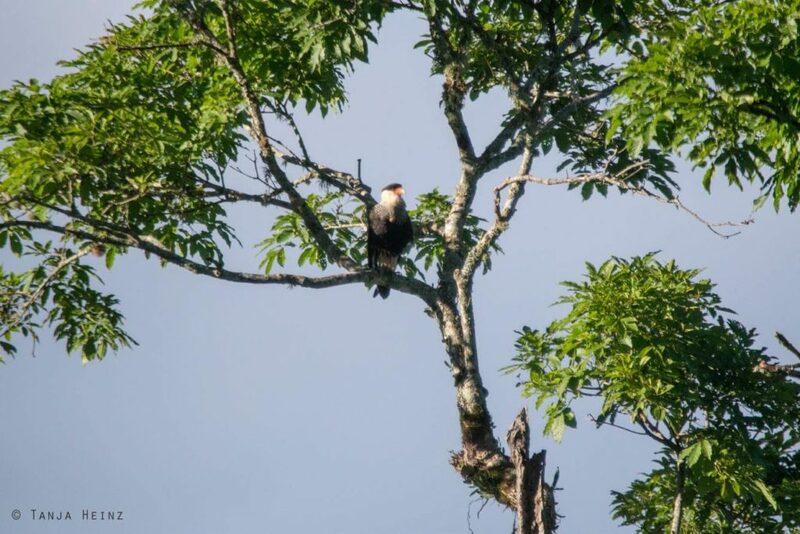 He offers bird excursions not only in Rio de Janeiro in the Itatiaia National Park, but also excursions in São Paulo like in Ubatuba or on the Trilha dos Tucanos. We participated in a one-day excursion in the Itatiaia National Park. Hudson picked us up punctually at 6:00 a.m. in the morning in front of our accomodation. Immediately he asked us about our individual aims in the Itatiaia National Parks. That means, which birds we wished to see. 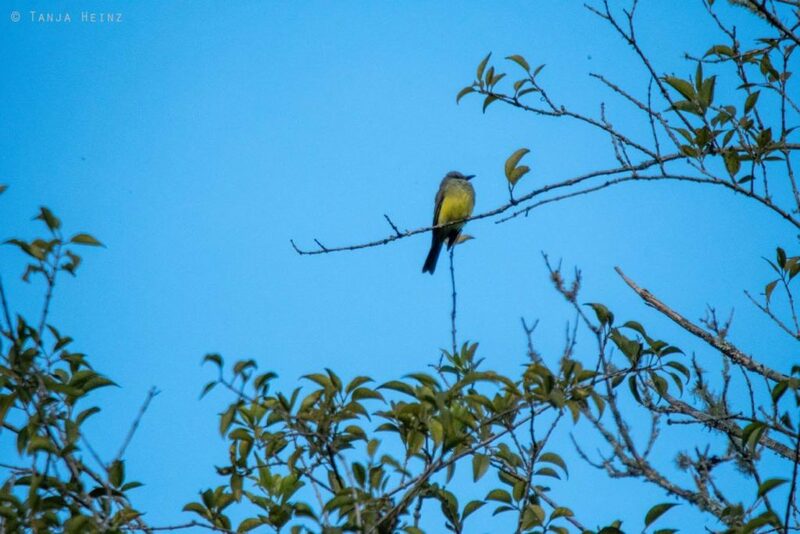 As I had not known the Brazilian birdlife, I was happy with any bird. Up to that time I observed almost every bird for the first time. 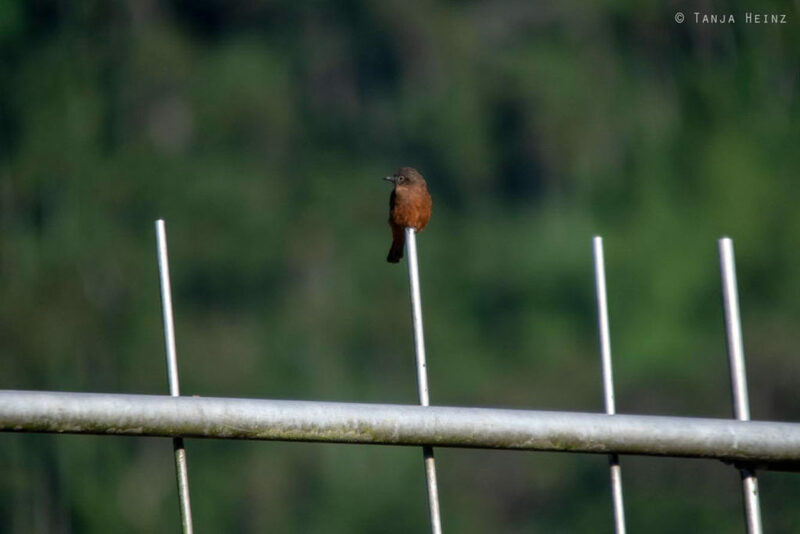 But if you are interested in one specific bird in the Itatiaia National Park, then Hudson will go searching for this specific bird. 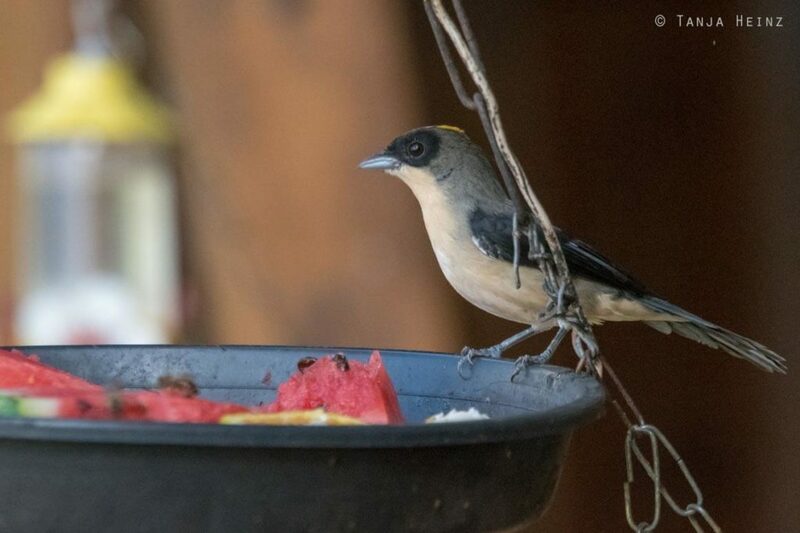 Nevertheless, there is never a guarantee that you will see a specific bird, but on a tour with BirdsRio Birdwatching you might increase your chances to see this specific bird as Hudson is an expert not only with respect to Brazilian birdlife, he also knows the Itatiaia National Park very well. As I mentioned above, we stayed two full days in the Itatiaia National Park. On our second day we observed considerably fewer birds. Thus, it is worth to book a tour at BirdsRio Birdwatching. 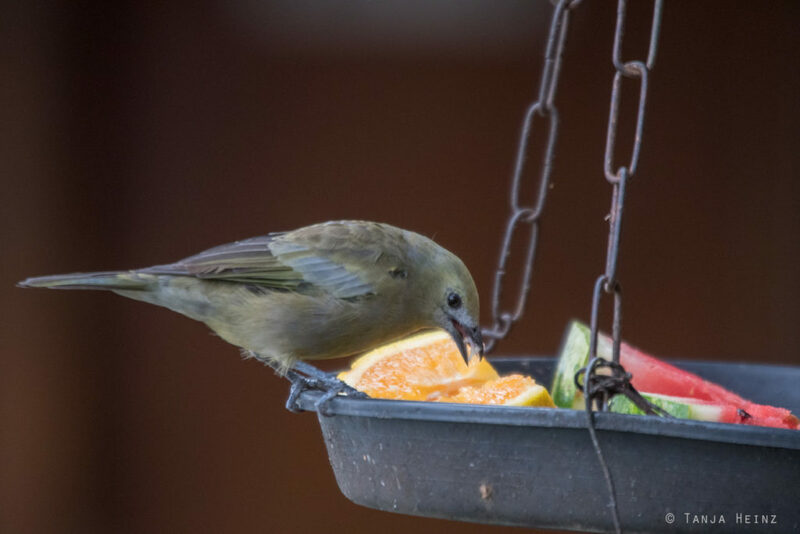 Our tour with Hudson from BirdsRio Birdwatching started at first at a hotel where quite many birds visited a feeding ground with fresh fruits. For me it was the perfect starting point to get to know the Brazilian birdlife as many different bird species visited this feeding ground. 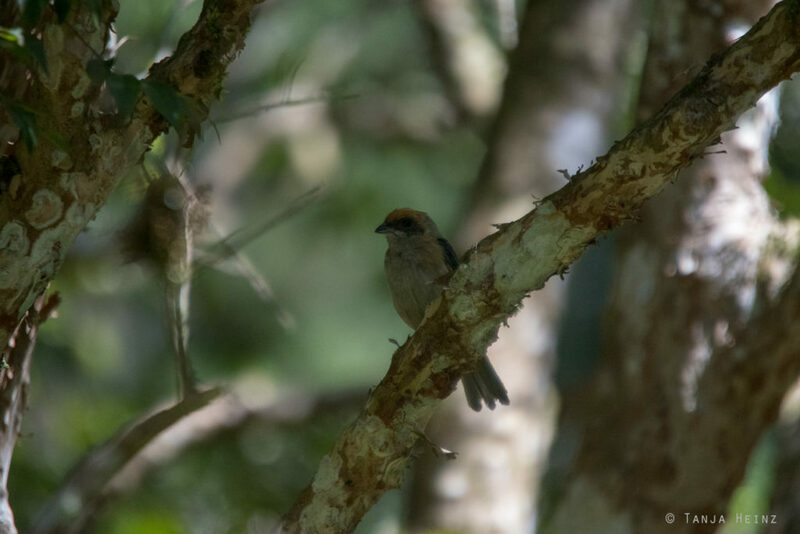 However, one of the first birds we observed were just in front of this hotel and these birds came from the bird family Cracidae (guans). To be more precisely, we observed some dusky-legged guans (Penelope obscura). 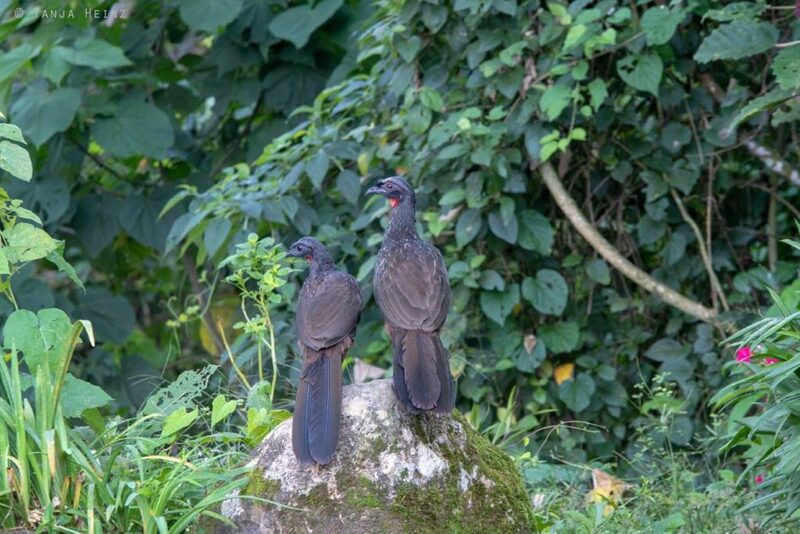 Dusky-legged guans live in the South and Southeast of Brazil. That means from Minas Gerais and Rio de Janeiro to Rio Grande do Sul, but as well in Uruguay, Paraguay, Argentina and Bolivia. 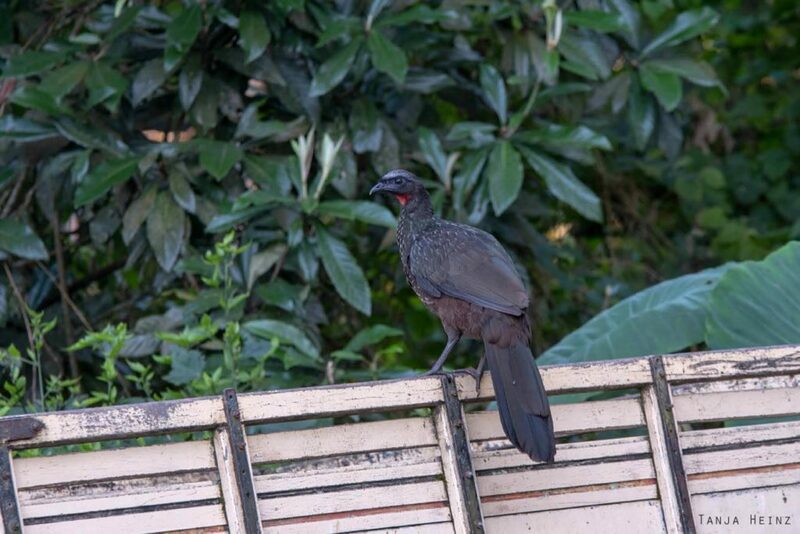 According to the IUCN the dusky-legged guan is not endangered, and thus, listed in the category “least concern”. By the way, males and females look almost the same, but there is one difference. Males can be recognized by their red iris which females do not have. Before we went to the feeding ground, there was another animal crossing our way. And that was a Guianan or Brazilian squirrel (Sciurus aestuans). 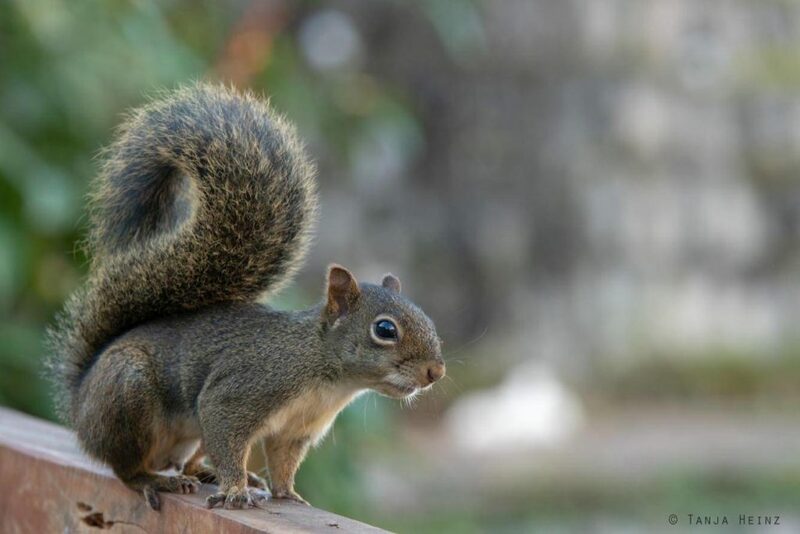 Guianan squirrels are widely distributed in South America. They occur not only in Brazil, but also in Venezuela, Colombia, French Guiana and Surinam. This Guiana squirrel appeard quite trusting to me, but we did not stay very long close to this rodent, because on that day I was especially focused on the birdlife of Brazil. So we walked into the direction of the feeding ground. 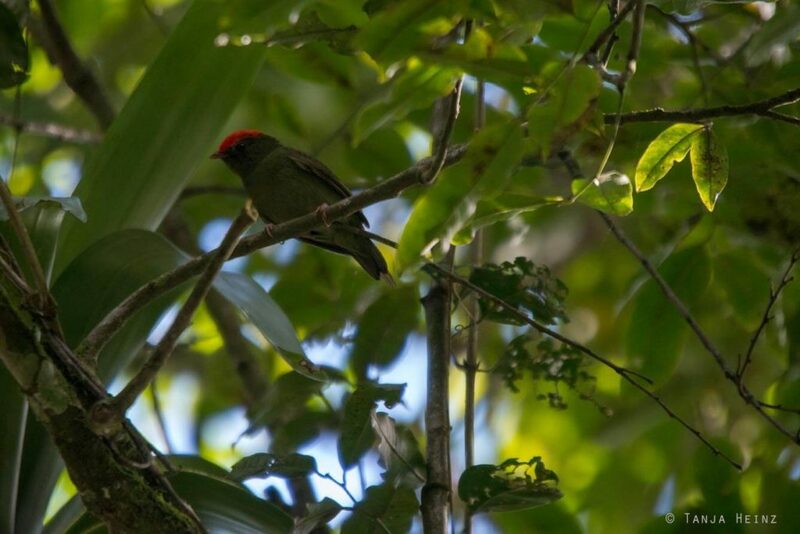 Indeed, we observed many birds that are typical for Brazil and in general for South America. 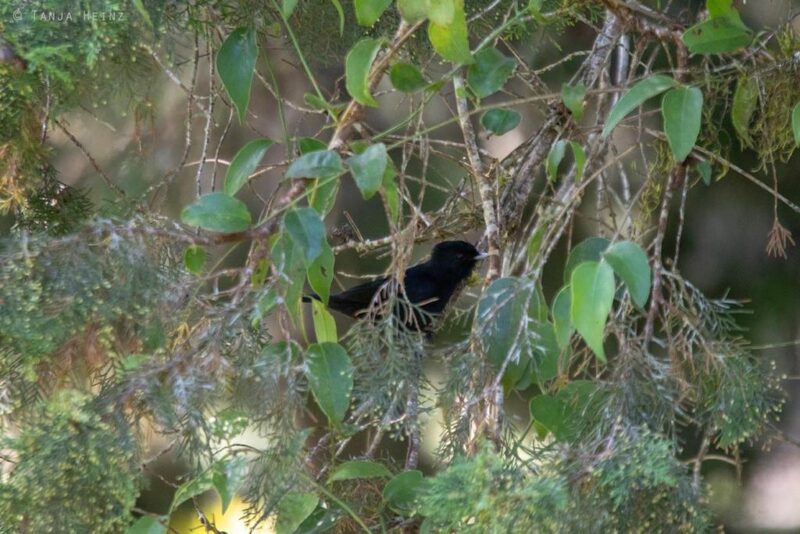 One of the first birds we observed at the feeding ground were golden-winged caciques (Cacicus chrysopterus) from the family Icteridae (icterids). 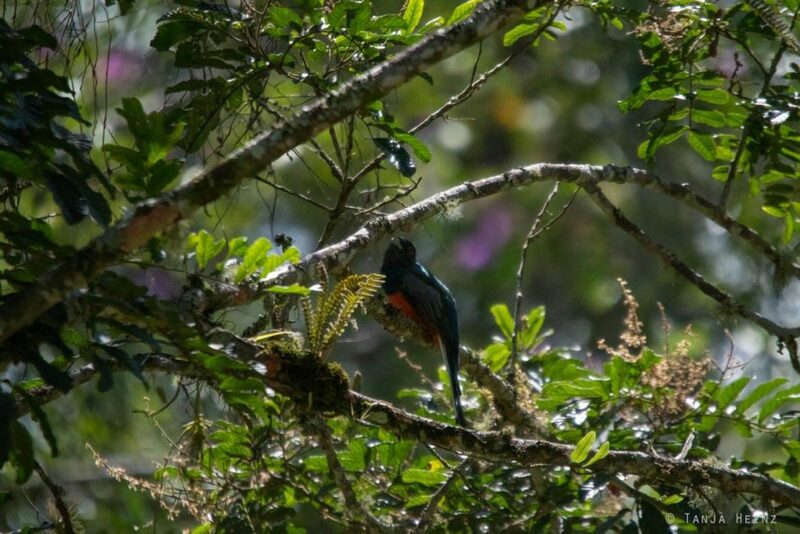 I observed these birds exclusively at this feeding ground in the Itatiaia National Park. 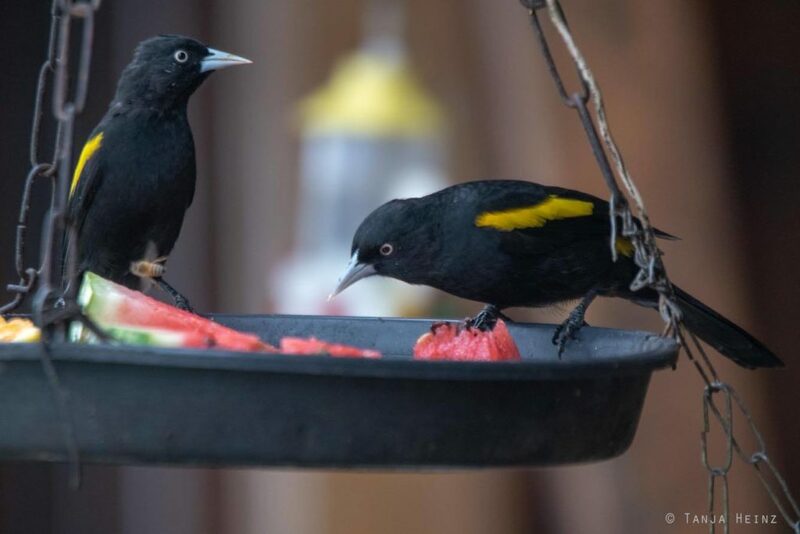 Golden-winged caciques occur not only in Brazil, but also in Argentina, Paraguay, Uruguay and Bolivia. I also saw two species of toucans (Ramphastidae) only at this feeding ground during my stay in the Itatiaia National Park. 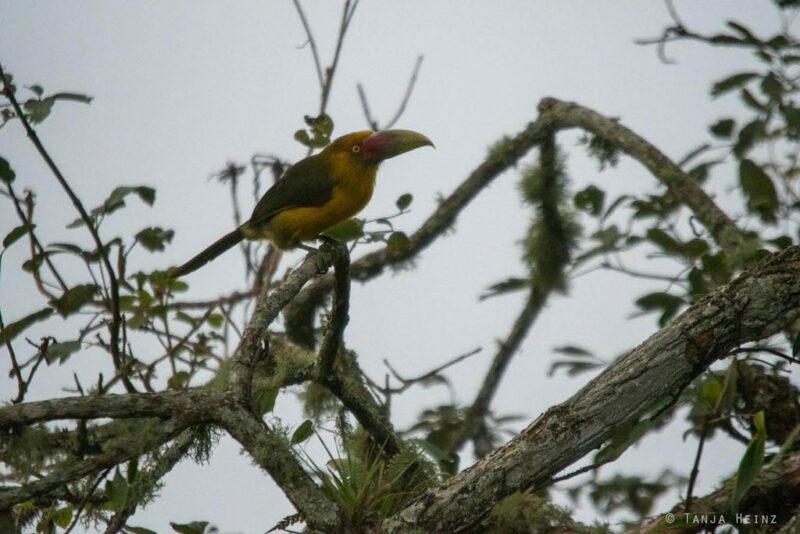 To be more precisely, I saw a saffron toucanet (Pteroglossus bailloni) and a red-breasted toucan (Ramphastos dicolorus). At first the saffron toucanet tried to approach as inconspicuously as possible, but due to its coloration it was easy to spot and to identify. Slowly and cautiously the saffron toucanet approached more and more the feeding ground. Then it changed its position on the branch and looked into the direction of the feeding ground. 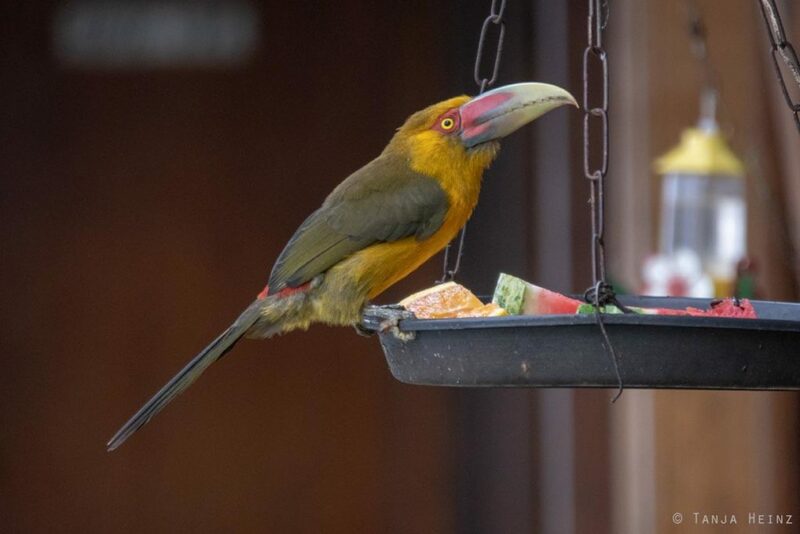 Accroding to the IUCN saffron toucanets are „near threatened“ and occur only in the Southeast of Brazil, in the East of Paraguay and in the Northeast of Argentina. 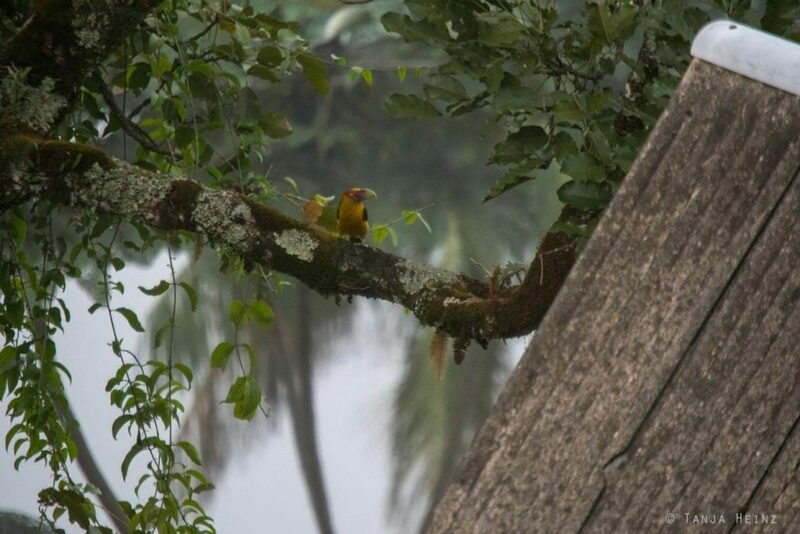 Finally the saffron toucanet reached the feeding ground. We tried to be as inconspicuous as possible. 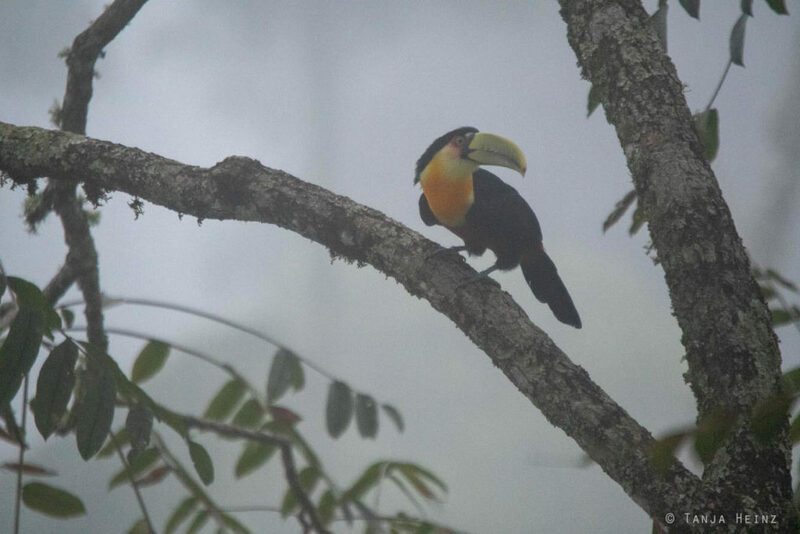 Later another toucan came close to the hotel. And that was a red-breasted toucan. 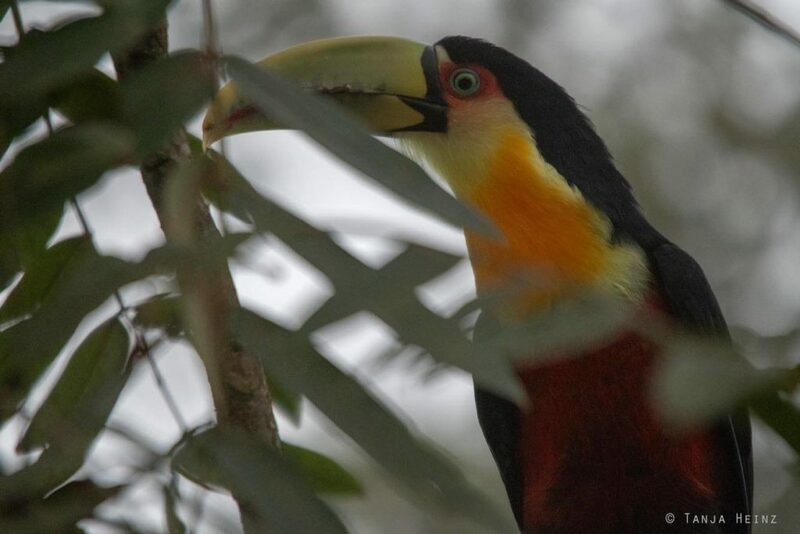 Like the saffron toucanet, the red-breasted toucan lives in Brazil, Paraguay and Argentina. 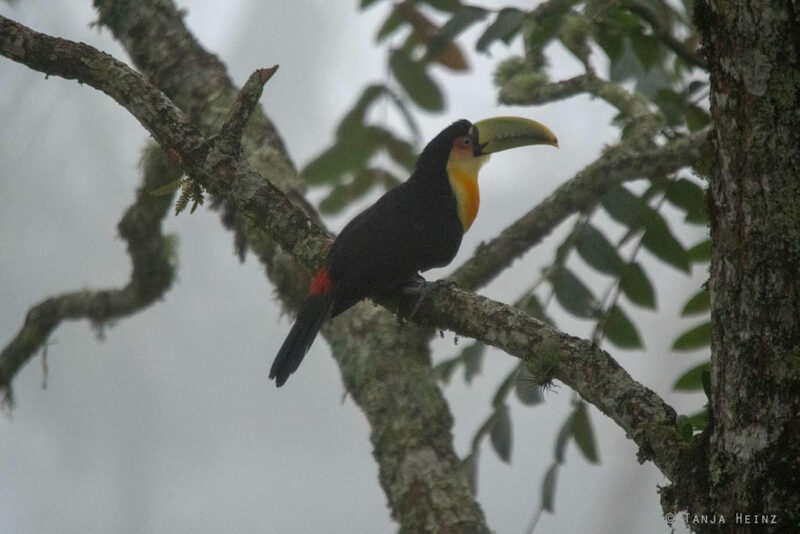 However, in contrast to the saffron toucanet, the red-breasted toucan is not “near threatend”, but listed in the category “least concern”. It became more and more foggy and more and more difficult to take photos of the beautiful colors of this bird. Finally the red-breasted toucan took a piece of food from the feeding ground, but vanished rapidly again behind vegetation. 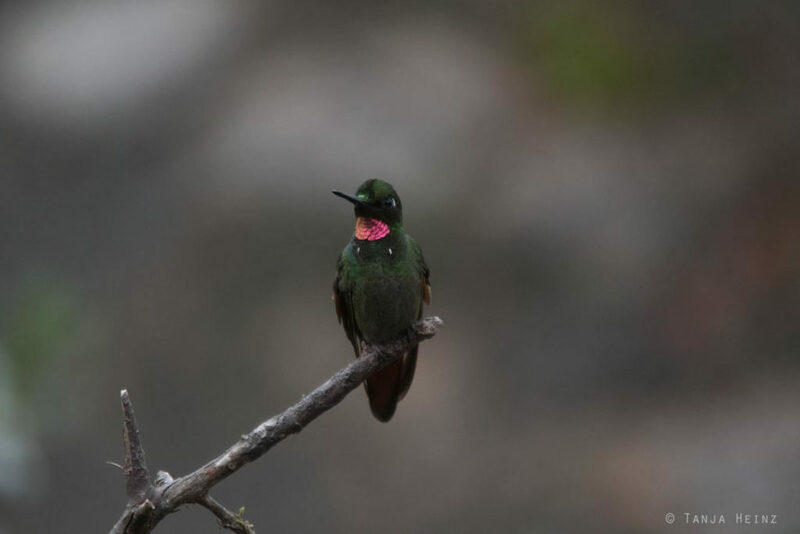 I was also happy to see so many hummingbirds (Trochilidae). Almost all of them I observed only at the feeding ground in the Itatiaia National Park. … and on the other hand a Brazilian ruby (Clytolaema rubricauda). 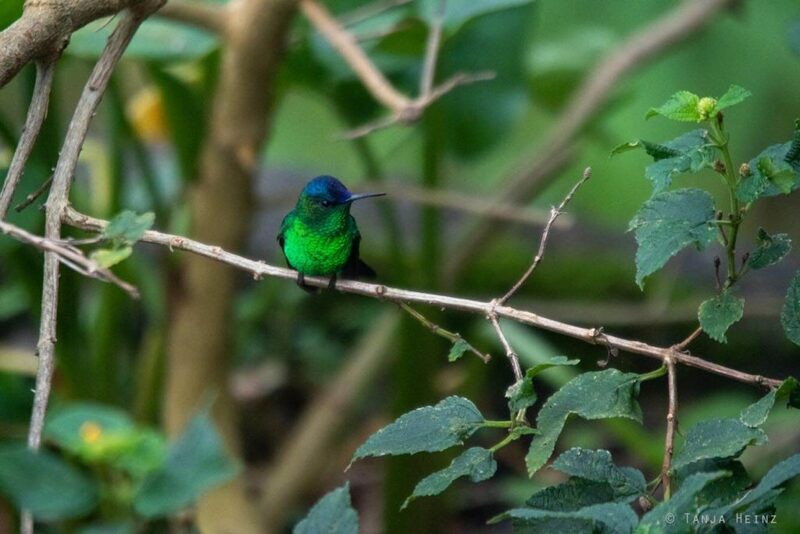 But did you know that more than 80 hummingbird species live in Brazil? 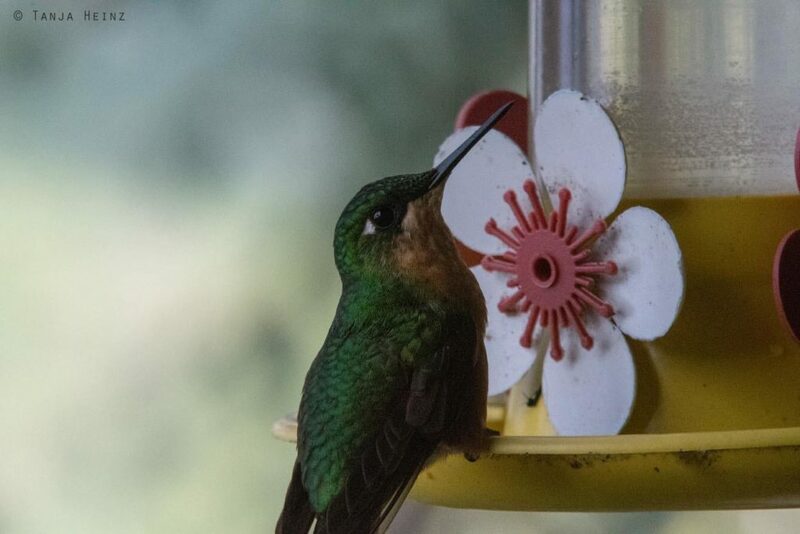 That means 23% of all hummingbird species worldwide? 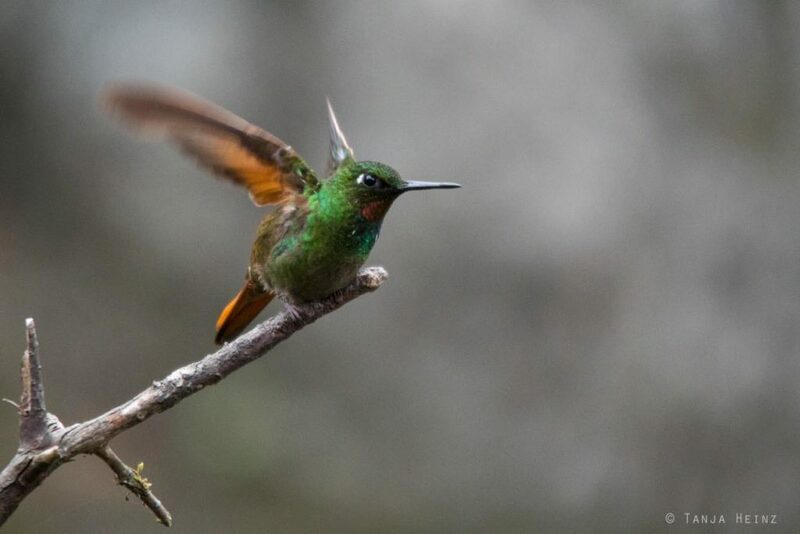 I’m not only impressed by the number of hummingbirds occuring in Brazil, but also that there exist so many hummingbirds in general. 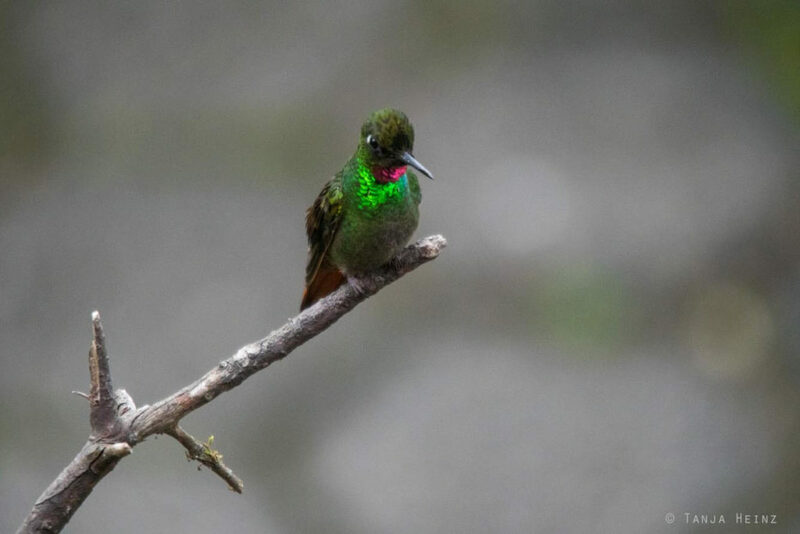 But hummingbirds actually do not occur worldwide. They only live in the Americas. In Europe, Asia, Africa or Australia you will search for them in vain. 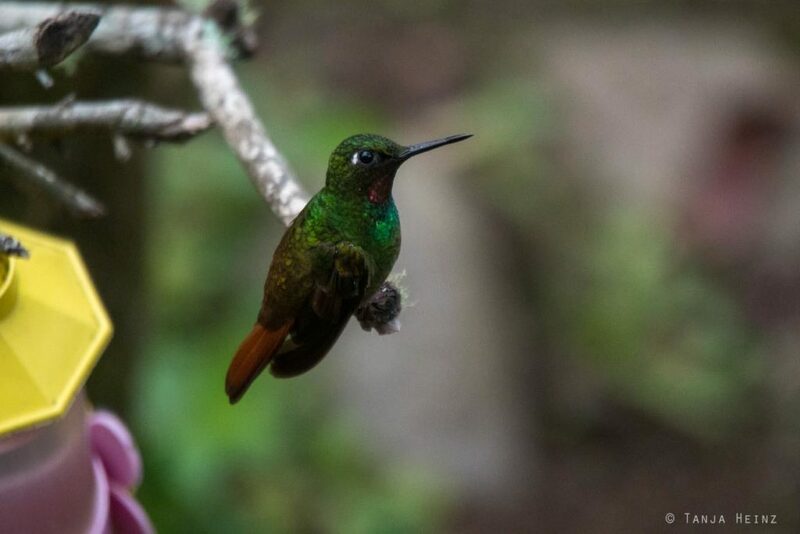 Therefore, I was especially happy meeting some hummingbirds in the Itatiaia National Park. Violet-capped woodnymphs occur in Brazil plus in Paraguay and Urugay. They are listed in the category “least concern” by the IUCN. 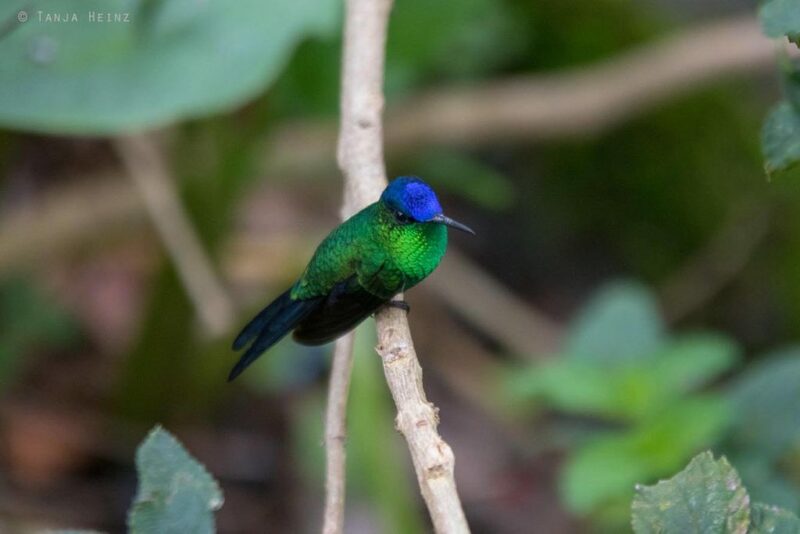 Violet-capped woodnymphs can be recognized by their black beaks and their shining green and violet-blue crown. However, only males do have this characteristic coloration. Depending on the position of its head, the coloration of its plumage appeared more or less intense. My position as well changed the effect of its plumage. In one tree I spotted a less colored violet-capped woodnymph. Was that a subadult? A Brazilian ruby as well came to the feeding ground again and again. But never stayed for much time. In general a Brazilian ruby is rather dark green. But they do have a pink or ruby patch on their throat. Depending on its movement and position, the colors of the Brazilian ruby appears more or less shining. By the way, the Brazilian ruby is endempic to Brazil, that means, it occurs only in Brazil. 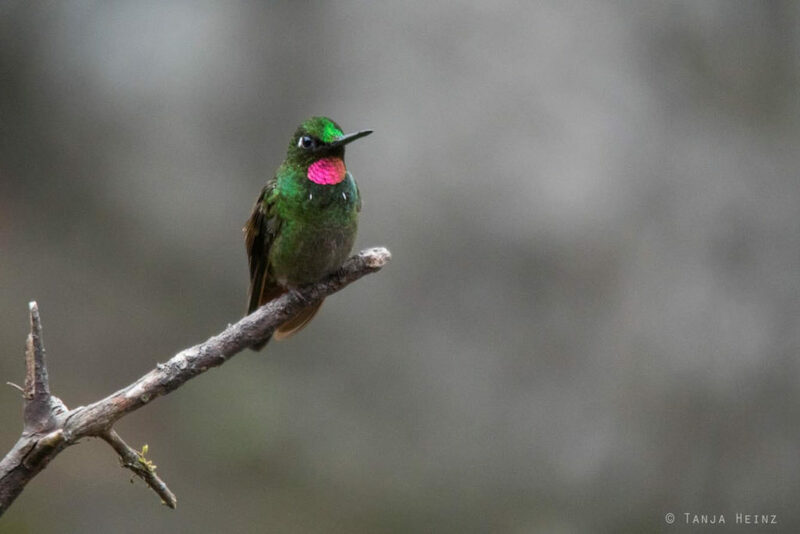 But still the Brazilian ruby is relatively widely distributed and listed in the category “least concern” by the IUCN. 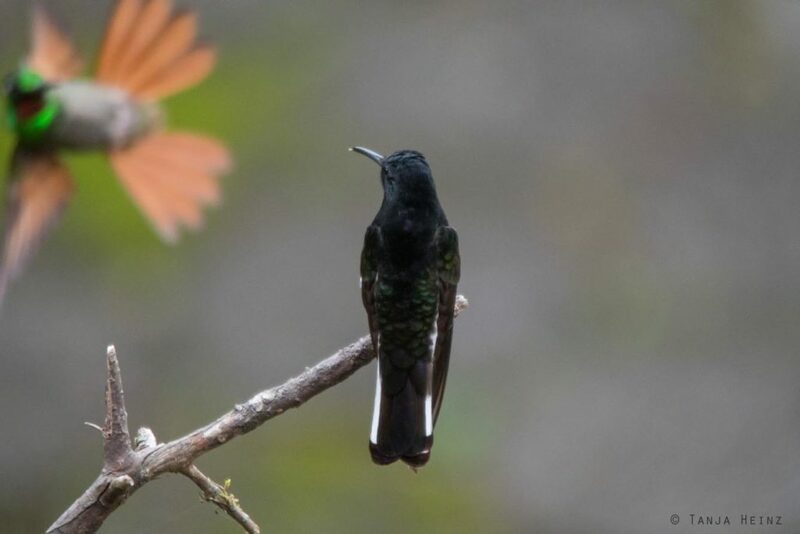 The black jacobin (Florisuga fusca), in contrast, looks different in coloration when compared to the other two hummingbirds. 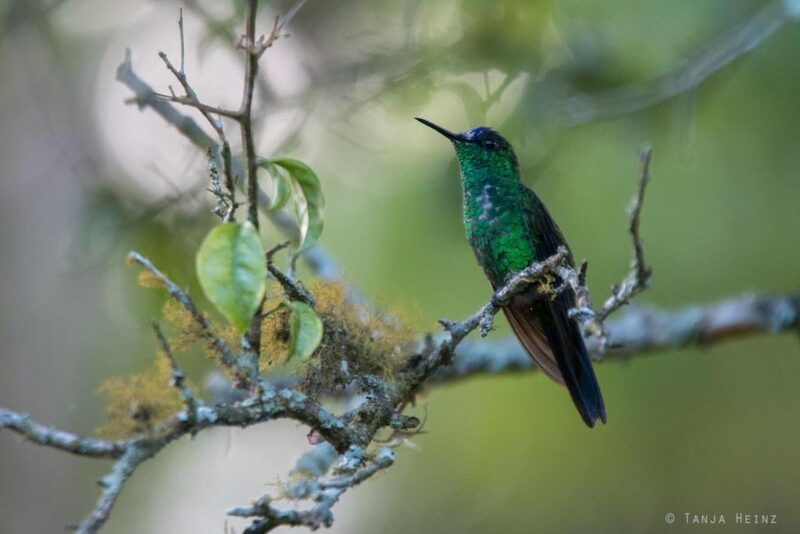 According to the IUCN the black jacobin ist of “least concern”. 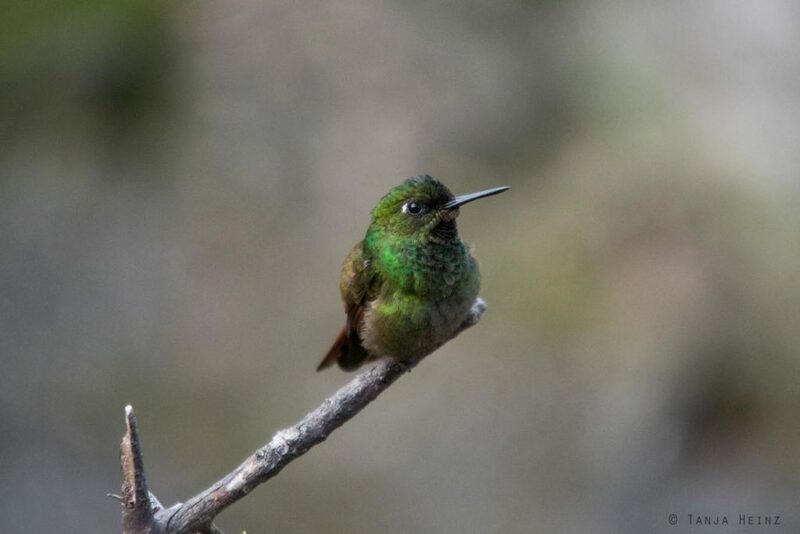 This hummingbird is native not only in Brazil, but also in Argentina, Uruguay and Paraguay. 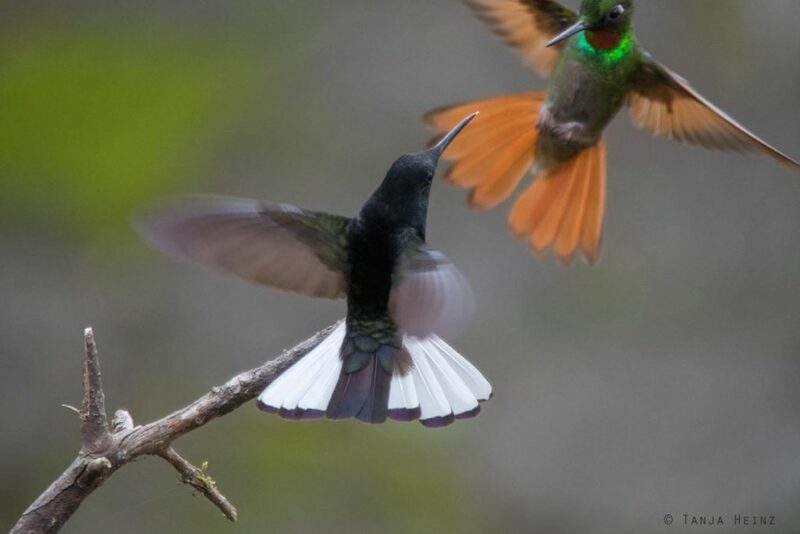 Like all hummingbirds, the black jacobin was continuously in motion. Only sometimes they rested on a branch for a few moments. 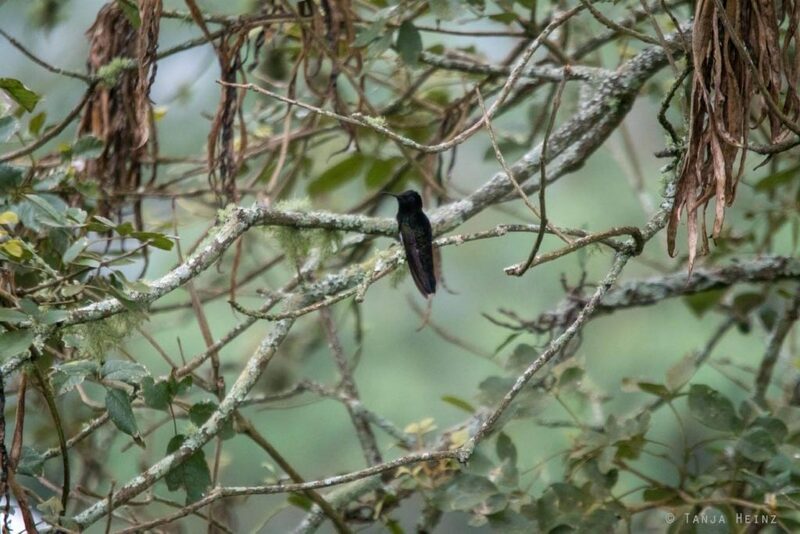 In one moment one black jacobin was leaving again its branch, but apparently not voluntary as a Brazilian ruby was flying into its direction. 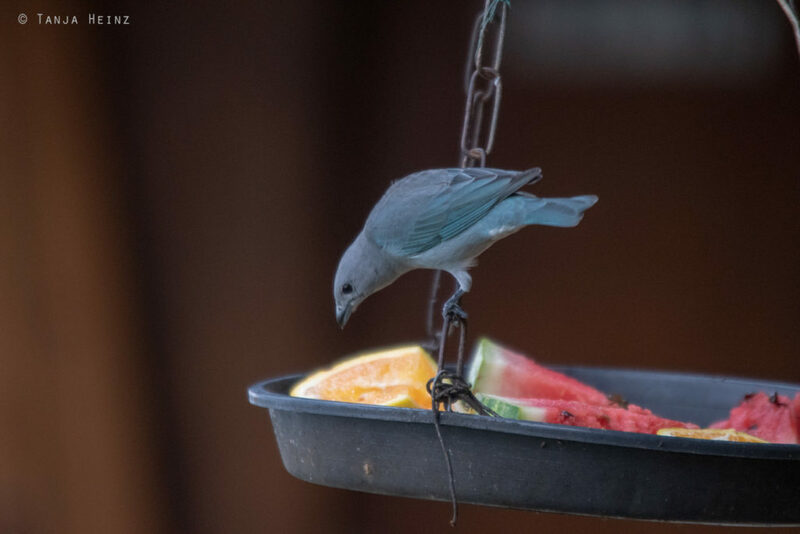 Of course I also spotted numerous tanagers (Thraupidae) at the feeding ground. 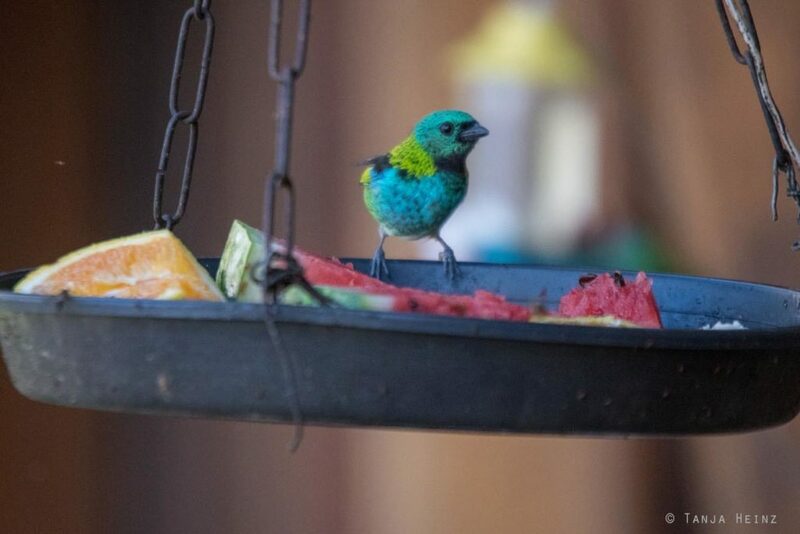 That is not surprising as Brazil hosts more than 150 different tanager species. 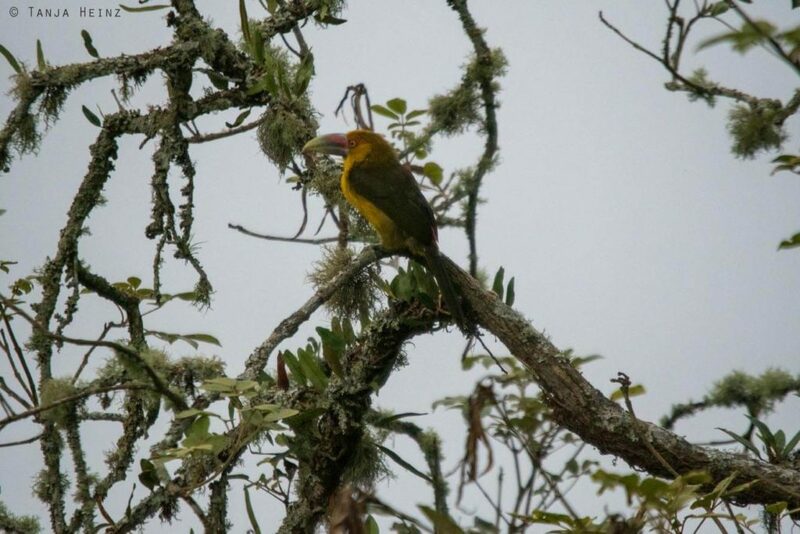 At the feeding ground I observed especially many green-headed tanagers (Tangara seledon). 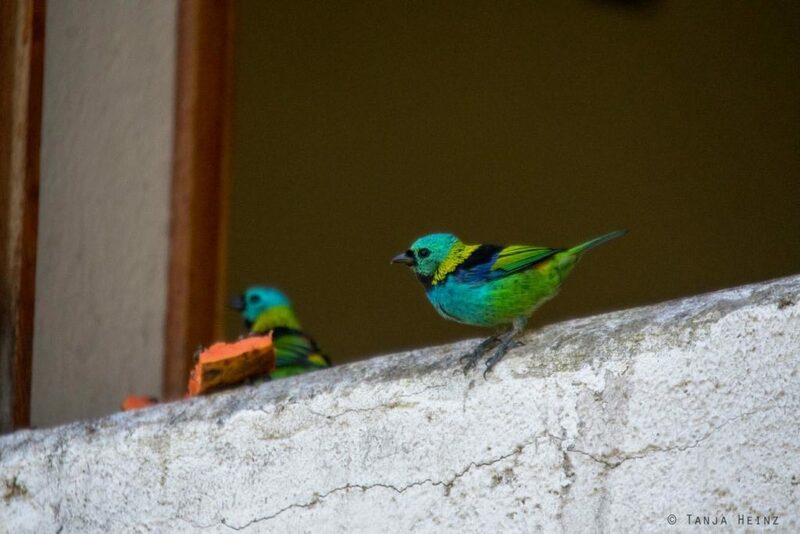 I encountered these birds several times in Brazil. 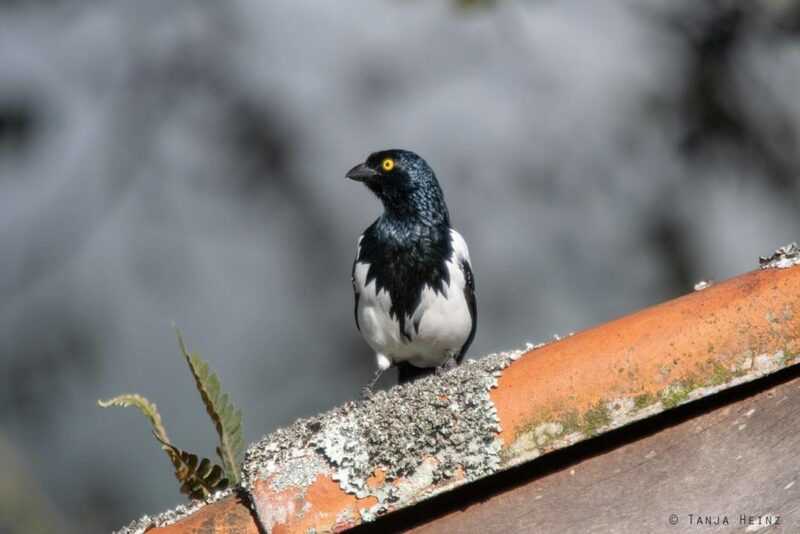 I spotted these birds again in the Itatiaia National Park on the windowsill of a house. 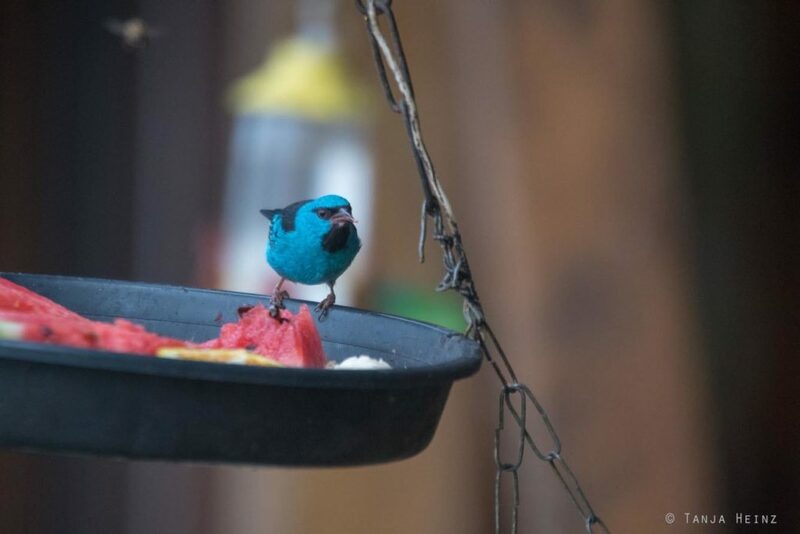 A blue dacnis (Dacnis cayana) showed up as well again and again at the feeding ground. 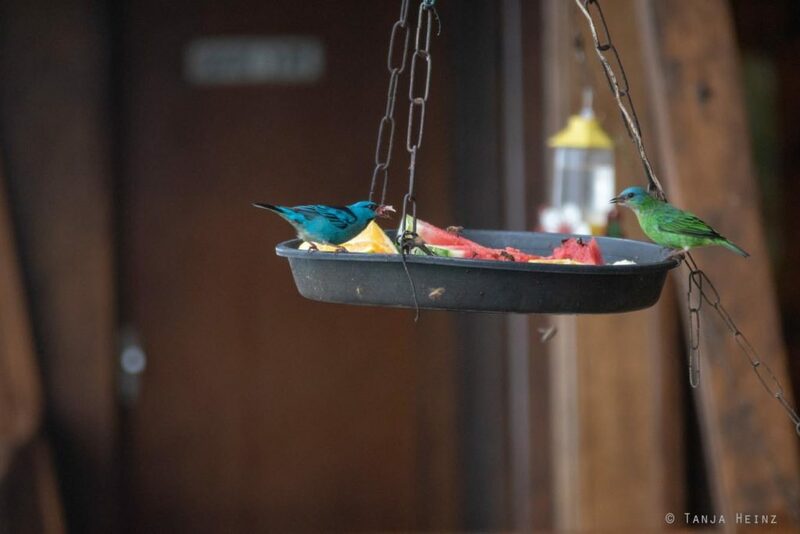 In one moment a blue dacnis male and blue dacnis female shared the feeding ground. 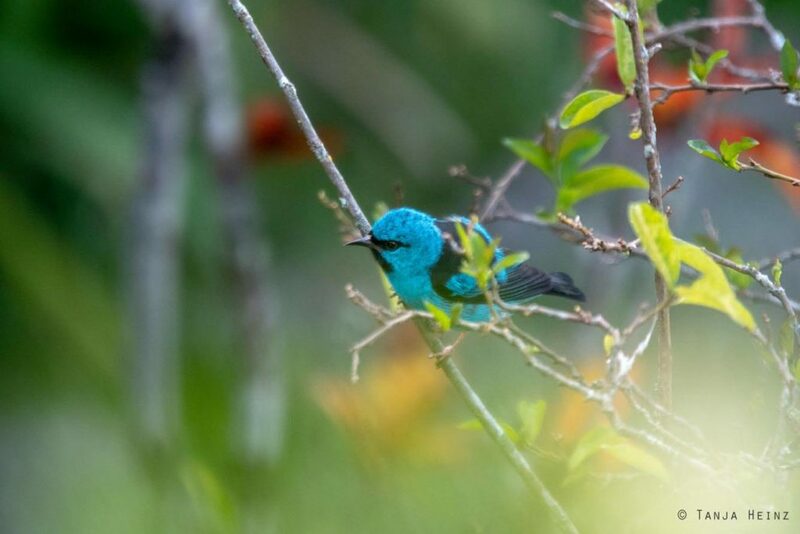 I spotted a blue dacnis again around the house of our accomodation on one beautiful and warm evening. Black-goggled tanagers (Trichothraupis melanops) were around at several spots. Like at the feeding ground. Or anywhere in the Atlantic Forest of the Itatiaia National Park. By the way, only males have a black face. Females do not. 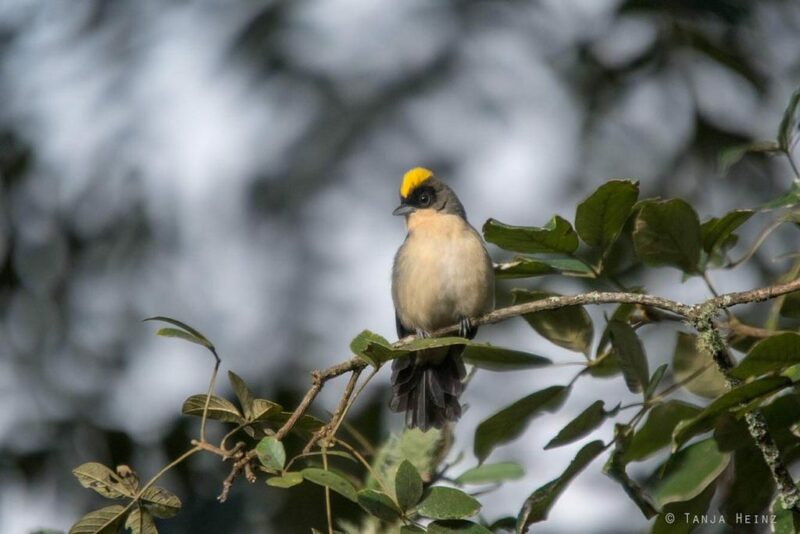 Furthermore, females, but also young, do not have such a yellow crown like males. 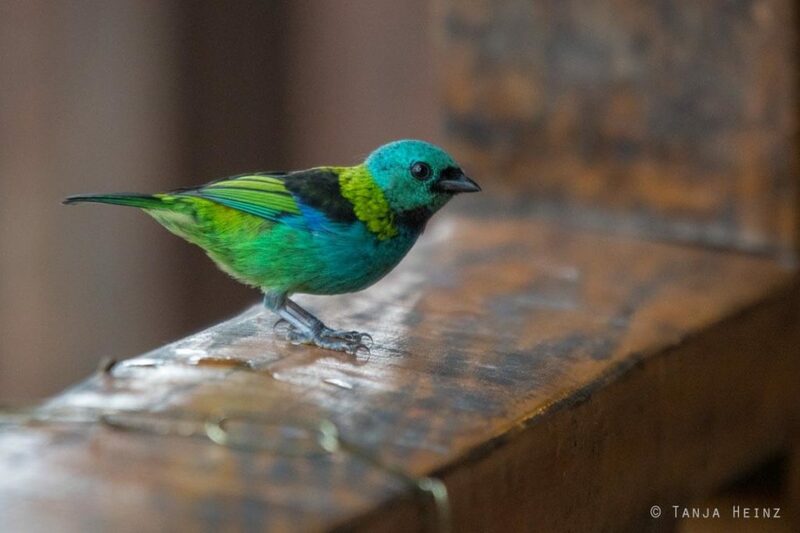 The following birds are as well of the tanager family. 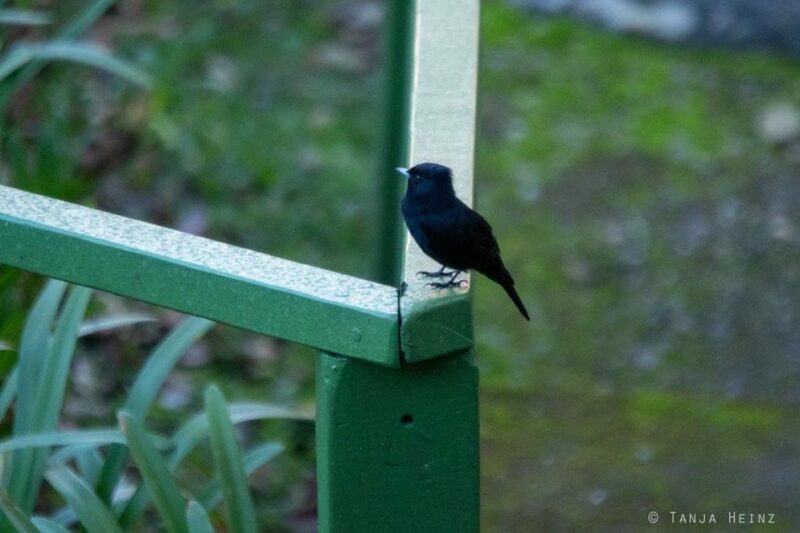 I observed these birds close to the feeding ground or anywhere in the Itatiaia National Park. 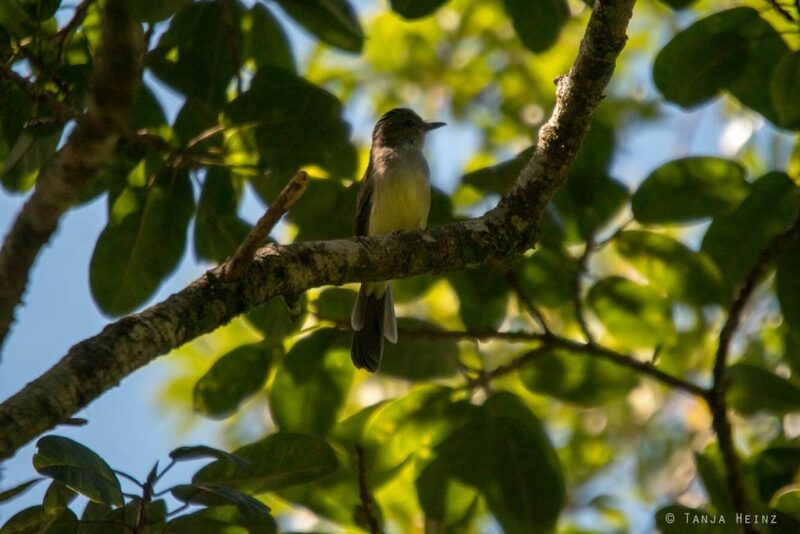 Another species-rich family with over 200 birds are the Tyrannidae (tyrant flycatchers). During those two days in the Itatiaia National Park I observed not that mandy of them. Some of them were not easy to identify. The following one might be of the Genus Knopolegus, but I cannot tell which species it is. 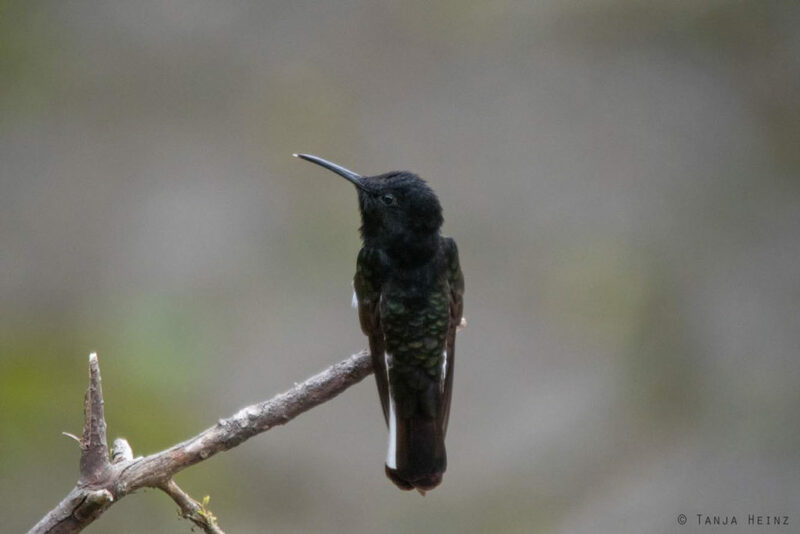 Maybe it was a velvety black tyrant (Knipolegus nigerrimus)? 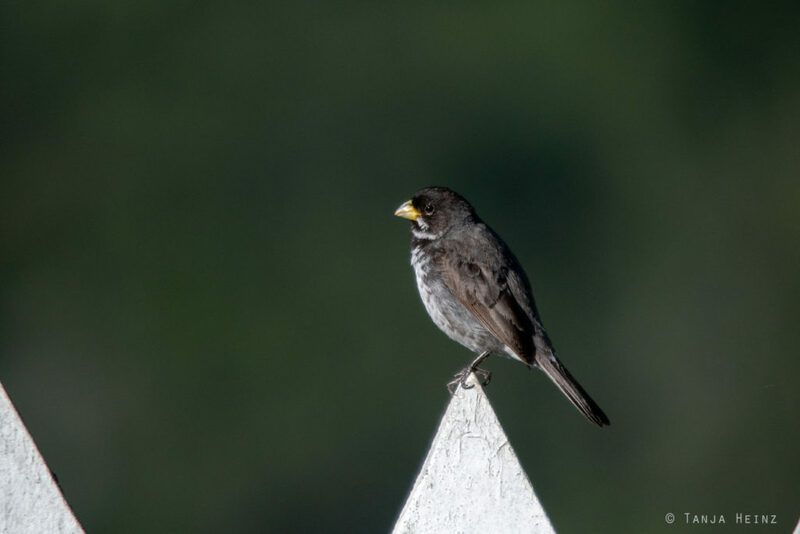 The following bird might be this species. 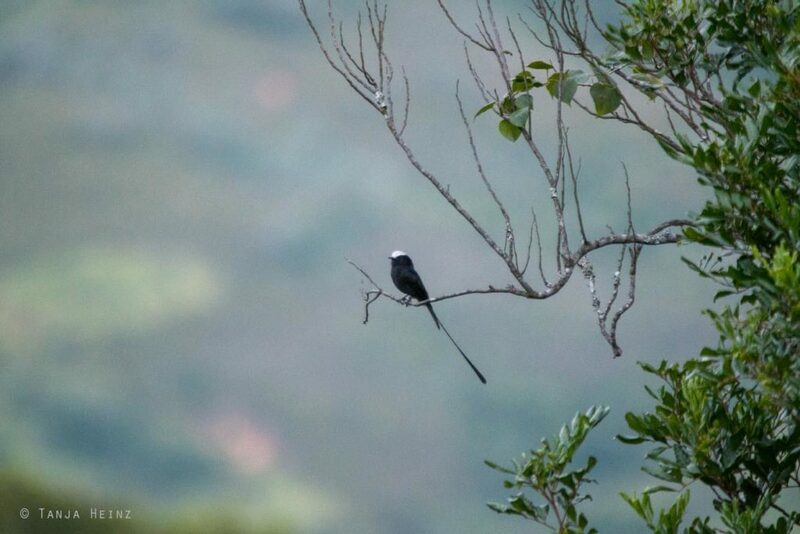 Later I saw a black tyrant in the forests of the Itatiaia National Park, but again, I couldn’t find out so far which species it is. 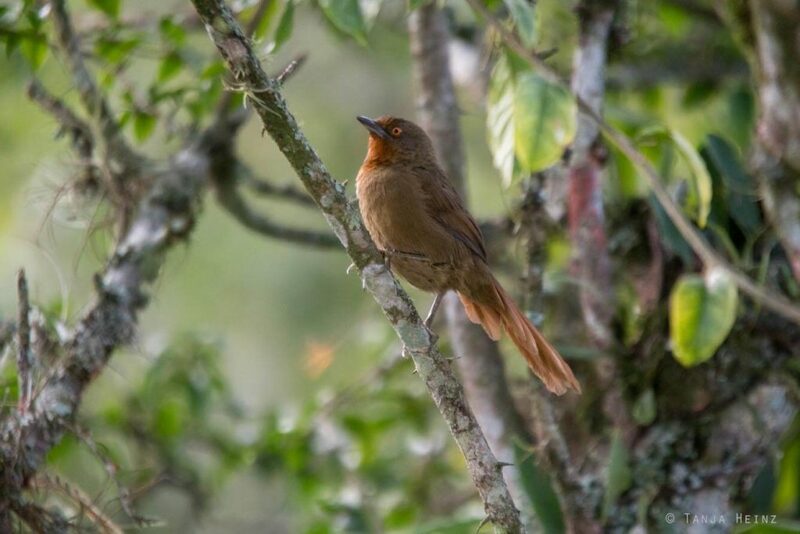 Some birds close to the feeding ground were easier to identify like this cliff flycatcher (Hirundinea ferruginea). 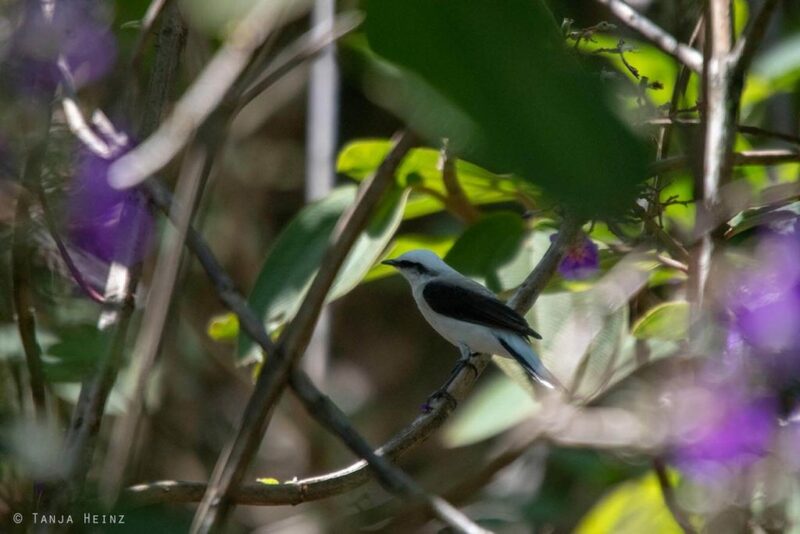 There were not many tyrant flycatchers close to the feeding ground. 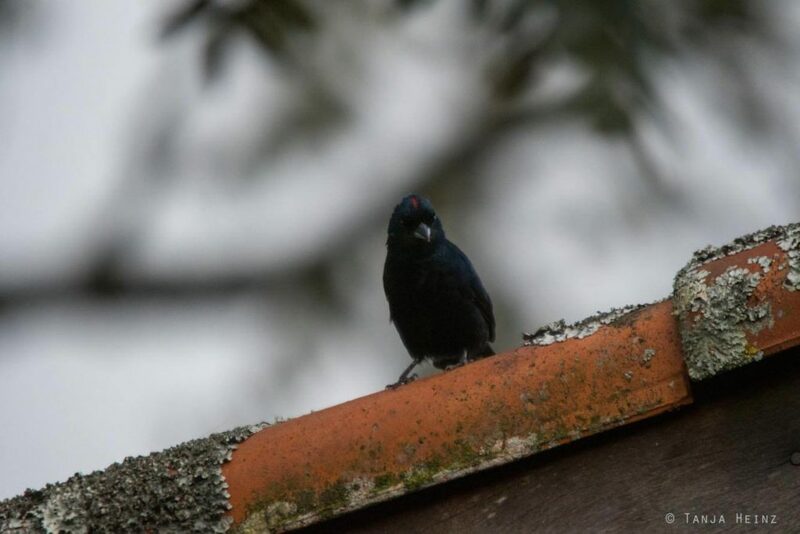 I rather spotted them around the house of our accomodation or in the Atlantic Forest of the Itatiaia National Park. There was one bird species I encountered quite often in Brazil. 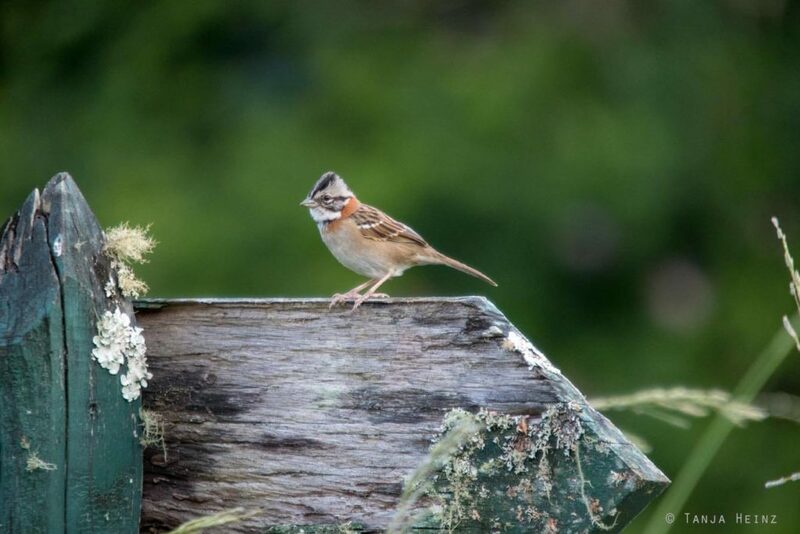 And that was the rufous-collared sparrow (Zonotrichia capensis) from the family Passerellidae (New World sparrows). 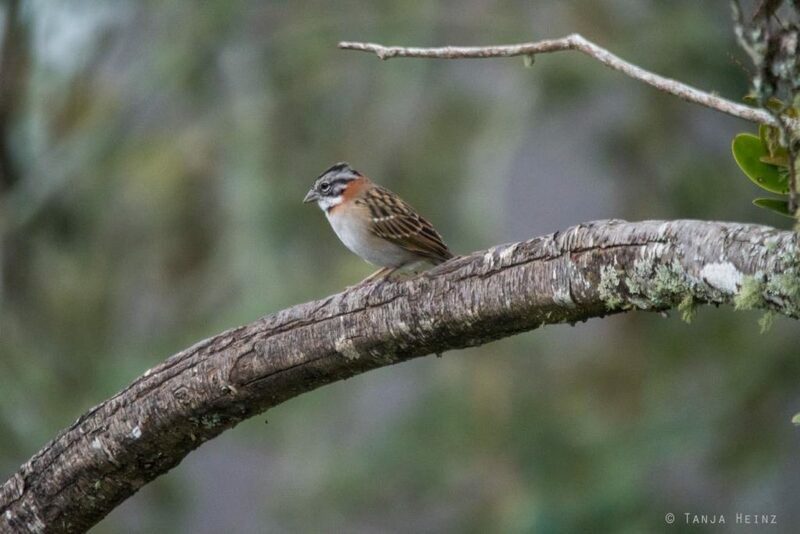 Even within the Itatiaia National Park I encountered the rufous-collared sparrow at different sites. The birds that will follow now were not at the feeding ground at all. I observed them only in the Atlantic Forest of the Itatiaia National Park. 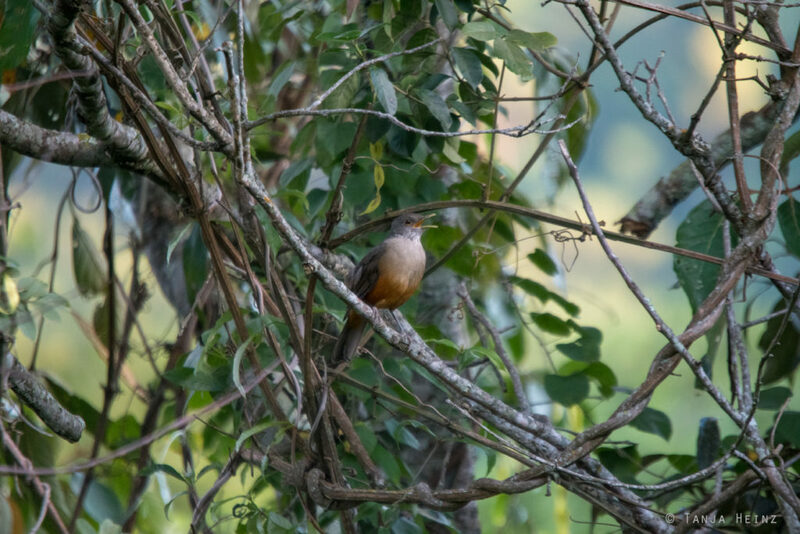 One of those birds was the rufous-bellied thrush (Turdus rufiventris) from the family Turdidae (thrushes). With respect to the Psittacidae (true parrots) I encountered two species. 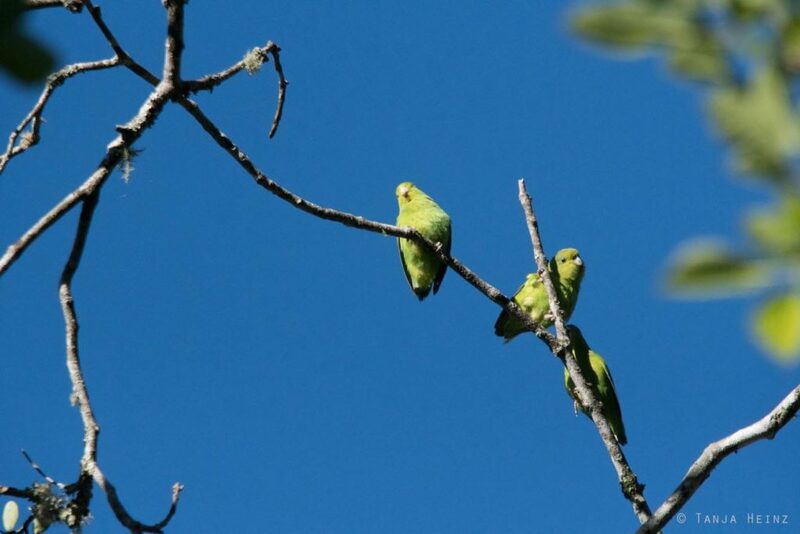 On one side there was the blue-winged parrotlet (Forpus xanthopterygius). 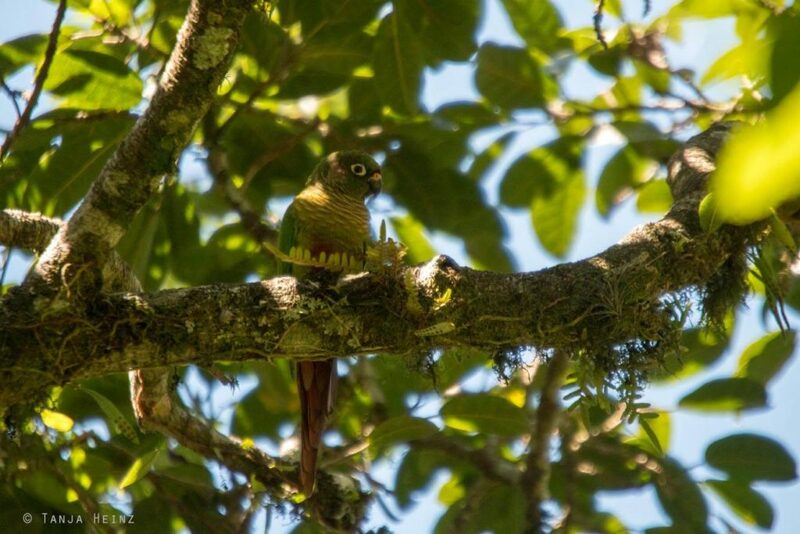 And on the other side there was the maroon-bellied parakeet (Pyrrhura frontalis). 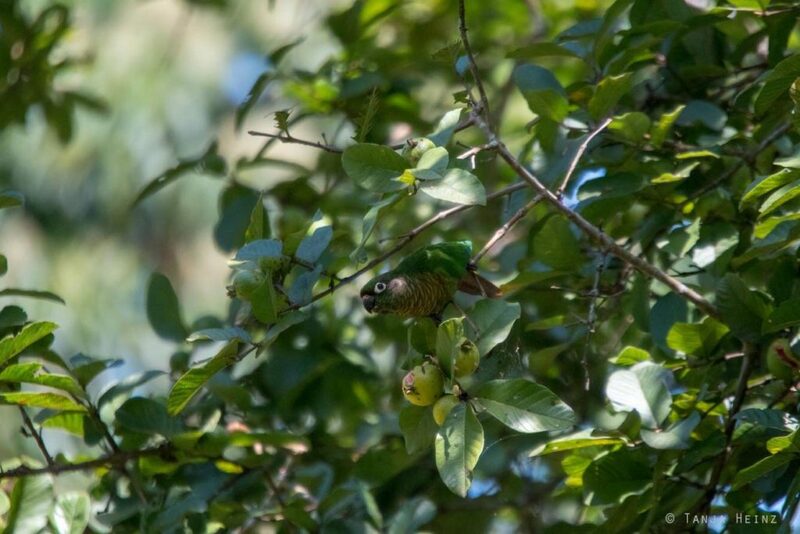 I encountered marron-bellied parakeets in total three times. On one occasion in a tree close to our accomodation. And in another occasion in a tree feeding on a guava. 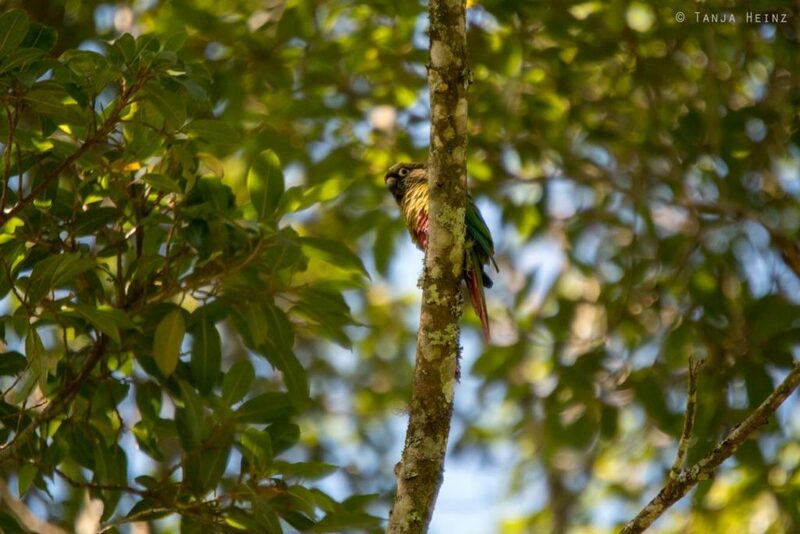 On one evening I spotted a maroon-bellied parakeet hidden in a tree just beside the house of our accomodation. As much as I enjoyed the parrots, as much I was looking forward to see birds of the family Furnariidae (ovenbirds). 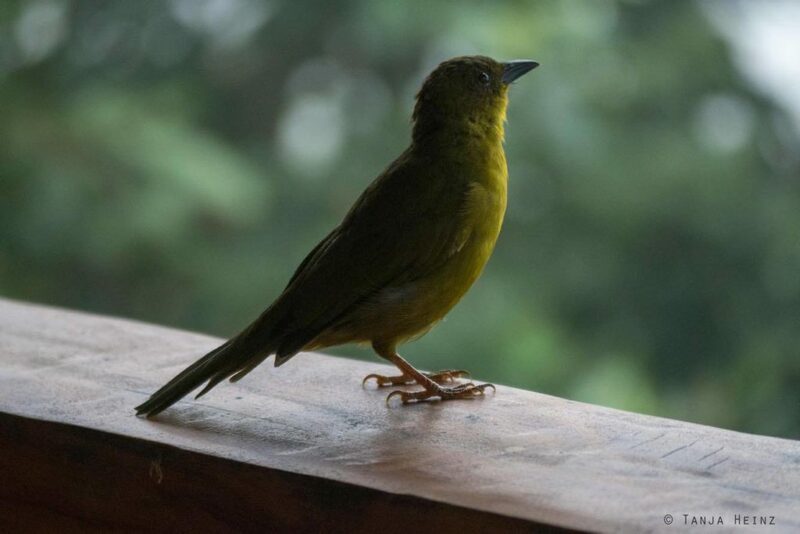 I encountered ovenbirds already in Itaúnas. And that was a rufous hornero (Furnarius rufus). In Itaúnas I observed them how they were building their nest. 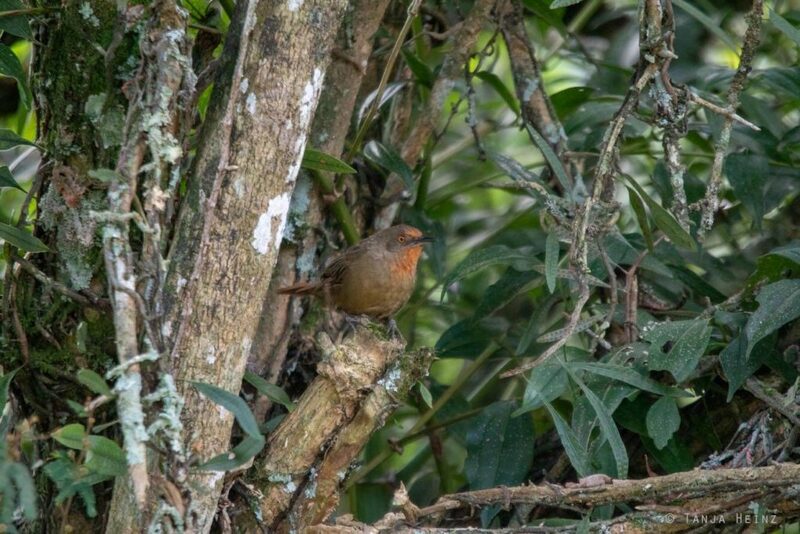 I did not meet any rufous hornero again in the Itatiaia National Park, however, there I spotted four more species of them like the black-capped foliage-gleaner (Philydor atricapillus). 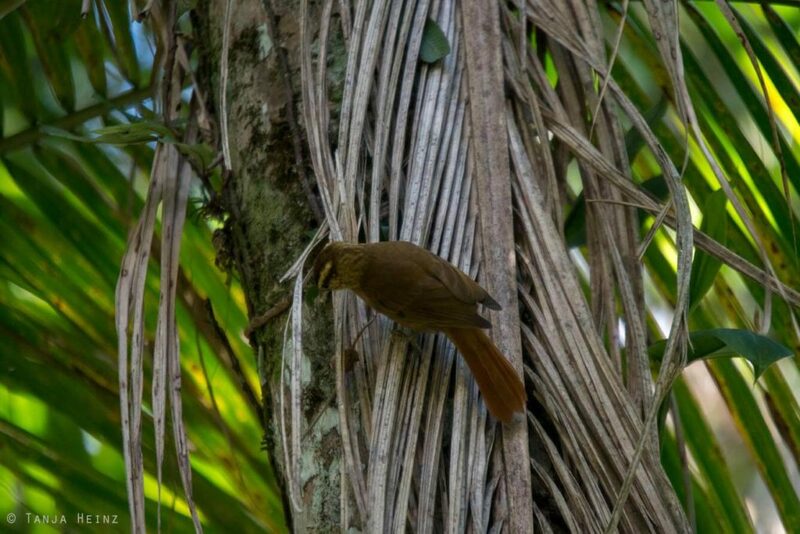 But also the olivaceous woodcreeper (Sittasomus griseicapillus). 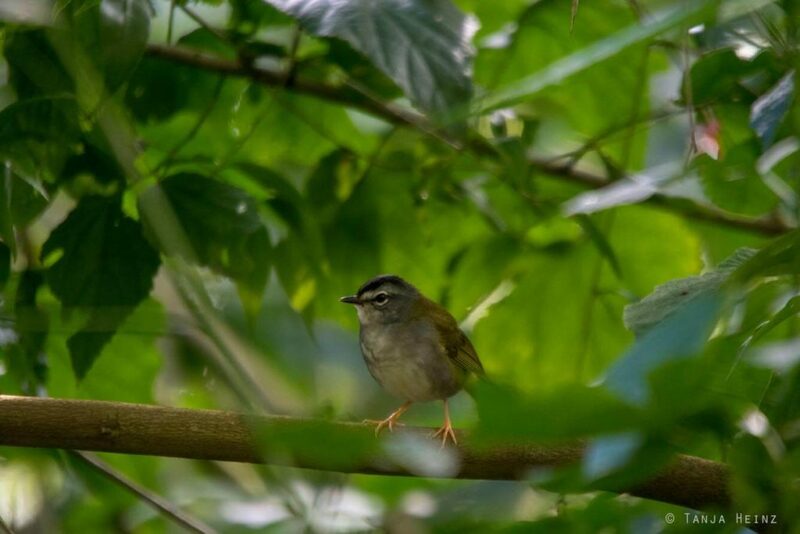 Or the White-browed Foliage-gleaner (Anabacerthia amaurotis). Especially attractive was in my opinion the orange-eyed thornbird (Phacellodomus erythrophthalmus). 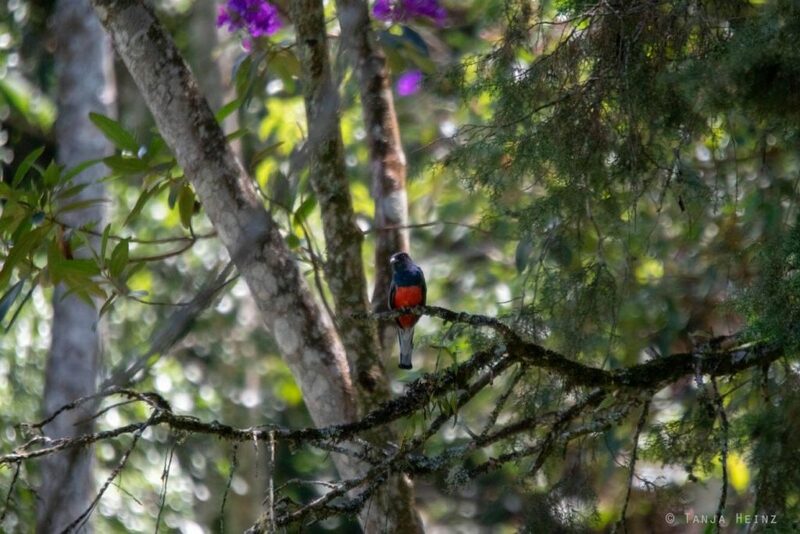 Very special was also the Surucua trogon (Trogon surrucura) of the family Troginidae (trogons). Special bird after special bird. The blue manakin (Chiroxiphia caudata) of the family Pipridae (manakins), again was a very special entounter. Unfortunately this bird vanished quite quickly again or I was to slow, respectively, to take a better photo. 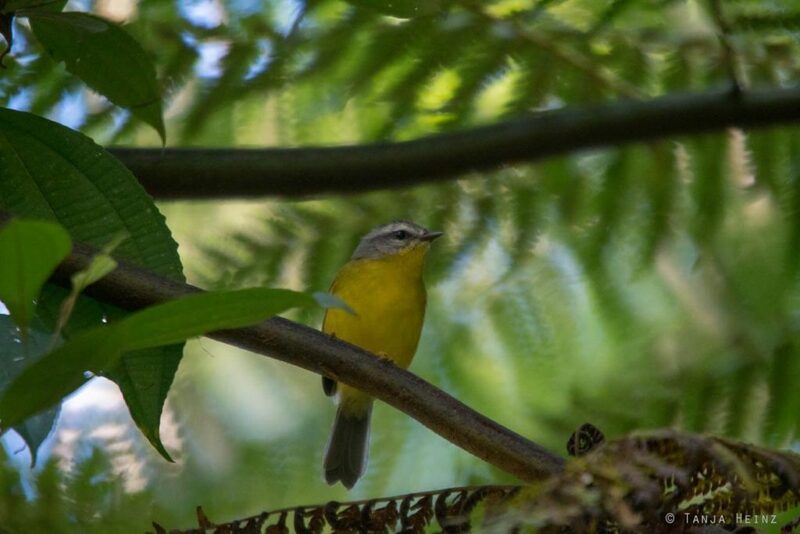 I got a better photograph from a golden-crowned warbler of the family Parulidae (New World warblers). The white-rimmed warbler (Myiothlypis leucoblephara) belongs to the same family. 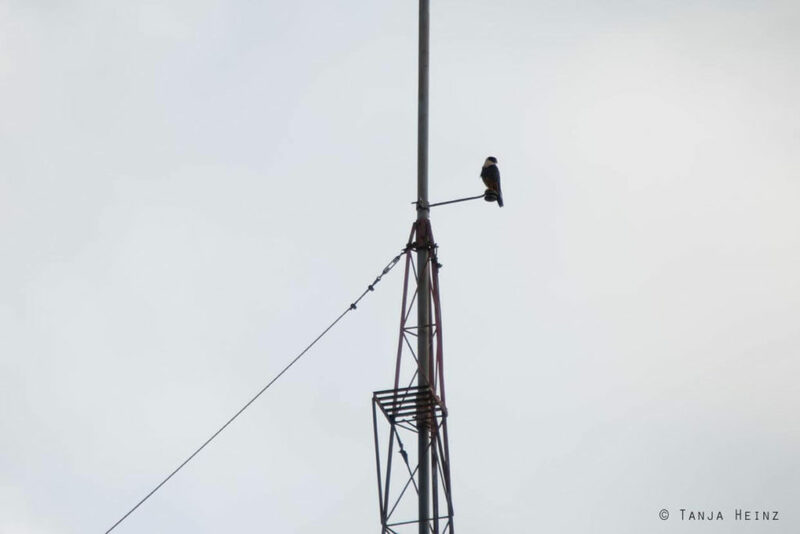 In general I observed many Southern crested caracaras (Caracara plancus) of the family Falconidae (falcons) in Brazil. So did I in the Itatiaia National Park. At the end of the bird excursion with Hudson from BirdsRio Birdwatching we encountered a bat falcon (Falco rufigularis) of the same family. 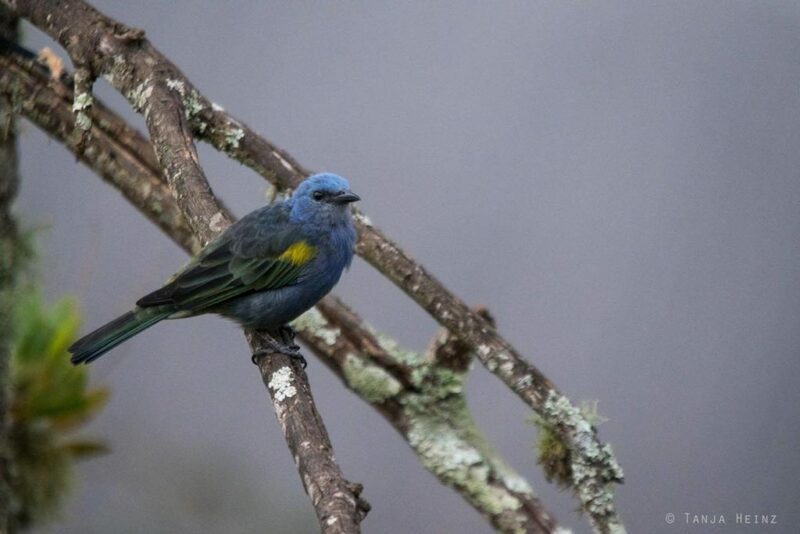 At the end I can say that the Itatiaia National Park is a perfect place to practise bird watching. 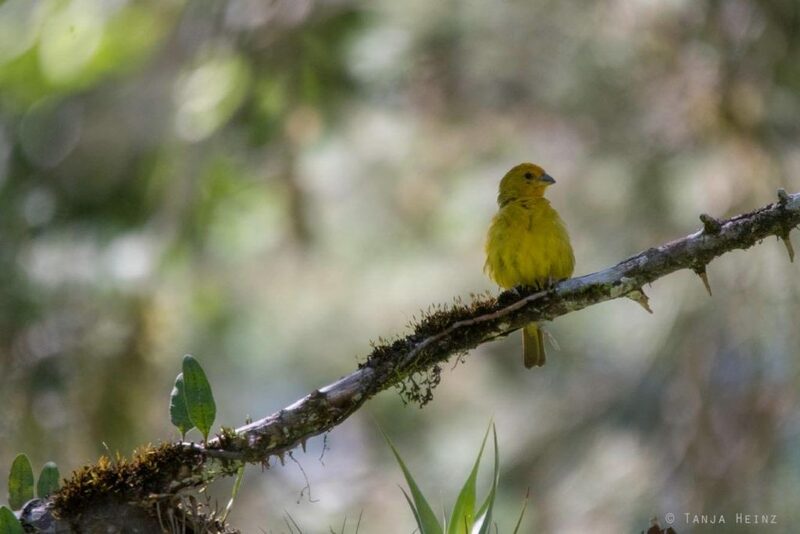 As the Itatiaia National Park is so diverse and so many different bird species occur in this national park, it is a great starting point to get into birding in general. 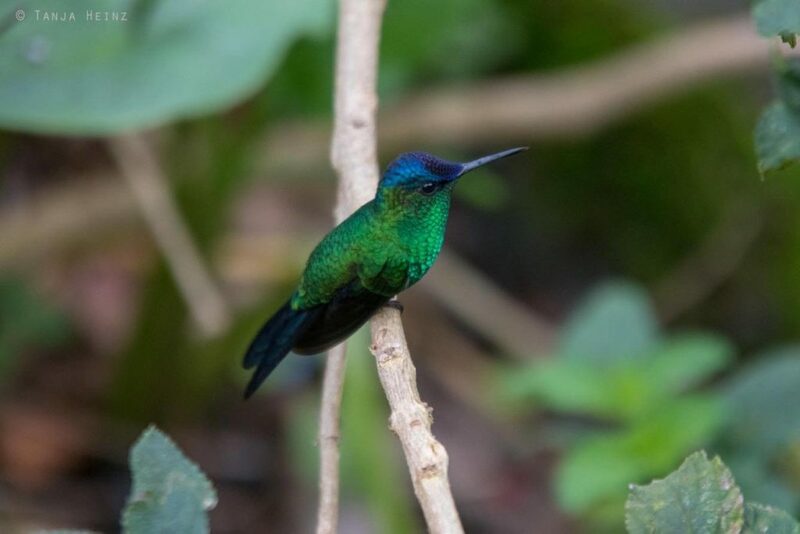 Toucans, hummingbirds, tanagers or tyrant flycatchers and many more bird species characterize considerably the fauna of the Itatiaia National Park. 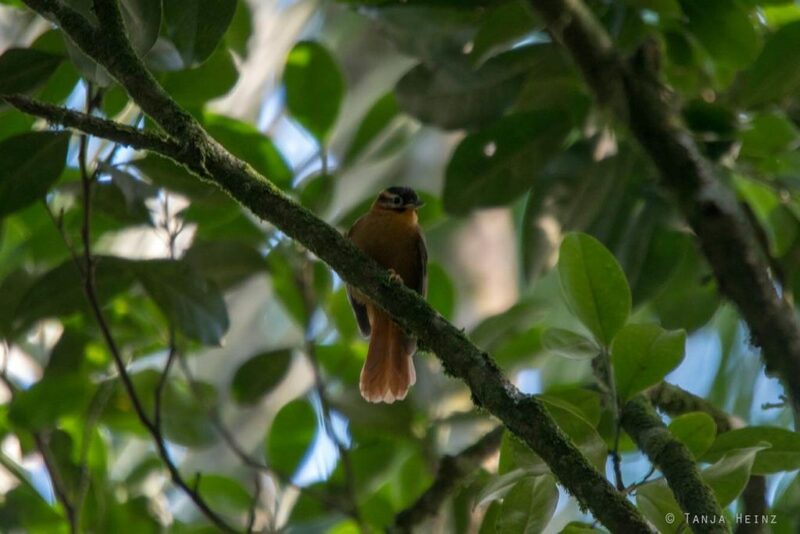 I observed all these birds in this articles during our two-day excursion to the Itatiaia National Park. 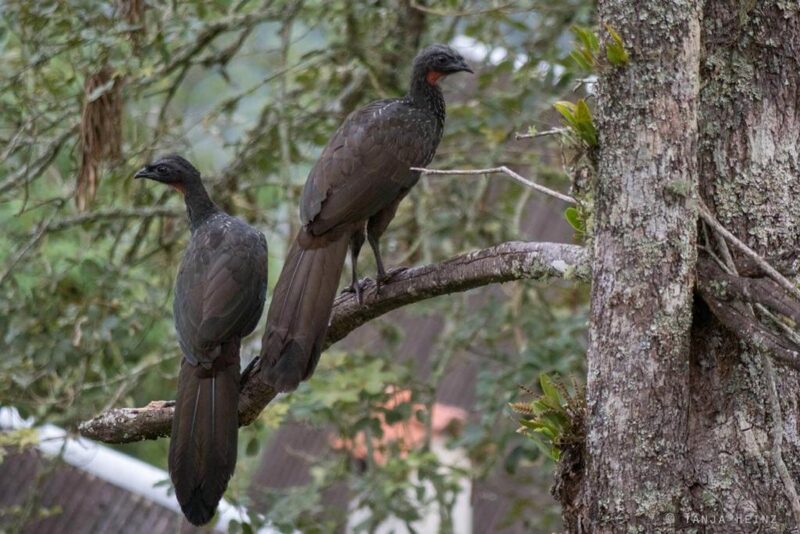 If you are interested to know more about other animals in the Itatiaia National Park than you can check my second article. The Itatiaia National Park is conntected to the Brazilian bus tranport network. Therefore you can reach the national park with public transport. As the Brazilian bus transport network is so well, we took the bus from the bus station Novo Rio in Rio de Janeiro to Itatiaia. As we had to travel from Silva Jardim to Rio de Janeiro on the same day, we bought our bus tickets at the bus station in Rio de Janeiro. The last bus leaves around half past five to Itatiaia. The bus journey from Rio de Janeiro to Itatiaia takes normally about three hours. Although our bus was punctual and there was no long stopover, we arrived one hour later in Itatiaia. As already mentioned, we bought our bus tickets in Rio de Janeiro. We bought them at the bus company Cidade do Aço. We paid 89,44 R$ for two tickets. It is also possible to buy tickets online at Clickbus or Brasil by Bus. It is possible to reach the Itatiaia National Park with public transport. There is a bus from the town Itatiaia to the visitor center within the Itatiaia National Park. And that is at 7:00, 12:00, 15:00 and 18:00. There is one more bus at 10:20 Uhr to the Itatiaia National Park, however, only to the entrance area. Correspondingly, there is a bus from the visitor center to Itatiaia at 8:00, 13:00, 16:00 and 19:00 and from the entrance area to Itatiaia at 11:00. As we arrived very late, we had to take a taxi from the bus station in Itatiaia to the Itatiaia National Park. The Itatiaia bus station Rodoviária De Itatiaia is located in the Rua 284, BR-485, 2 – Campo Alegre, Itatiaia – RJ, 27580-000. But here I have to mention that it was not so easy to find a taxi. There was no taxi waiting for clients at the bus station in Itatiaia. We had to contact a taxi driver via phone call. All taxi driver’s, however, were in the opposite part of the town. Thus, we had to pay as well the arrival of the taxi. We could not choose and had to agree with this deal. Furthermore, the address of our Airbnb accomodation was not easy to find, neither. Our taxi driver had to call some friends and collegues to find out more about the address of our accomodation. The taxi diver tried everything and finally he could drive us to our accomodation where our host was already waiting for us. When we left the Itatiaia National Park we actually wanted to take the bus back to the bus terminal in Itatiaia. Unfortunately, on that day the bus broke down. We waited and waited in vain. Fortunately our host was so nice and he drove us to the bus terminal. There is an entrance fee of 33 R$ for every visitor of the Itatiaia National Park. But Brazilians pay only 17,00 R$. Visitors that stay for several days in the national park pay for every additional day at the weekend only 50% and during the week 90% less. You get more information about the fees on the website of the Itatiaia National Park. Our accomodation in the Itatiaia National Park was located close to the entrance area. If you follow the Rua Wanderbilt Duarte de Barros you have to pass the entrance area and pay the fee for the national park. There you have to drive just a few hundred meters and you will see the driveway of the accomodation. We booked our accomodation via Airbnb and paid 107,55 Euro. 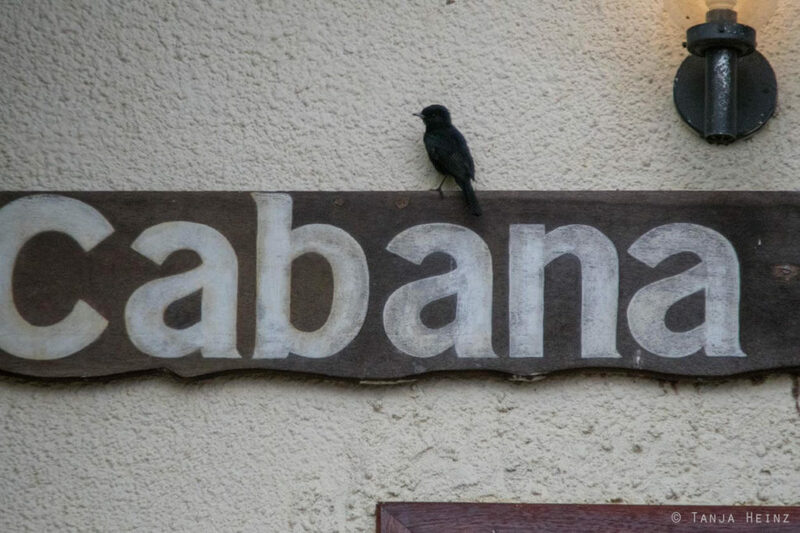 Check my second article about the Itatiaia National Park if you wish to see some photos of our accomodation. More information about the Itatiaia National Park on their respective webeite. More information about birds and a list about all birds occurring in Brazil on Wikipedia. A great website about birds in Brazil is WikiAves (but only in Portuguese). BirdsRio Birdwatching can be found on the Webseite.